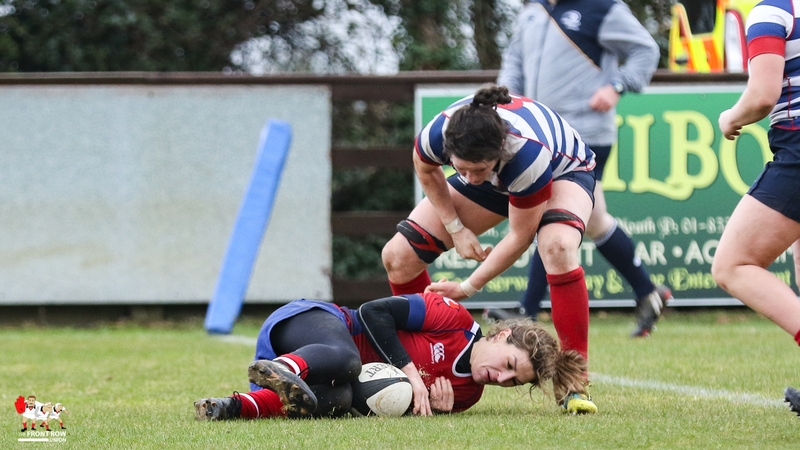 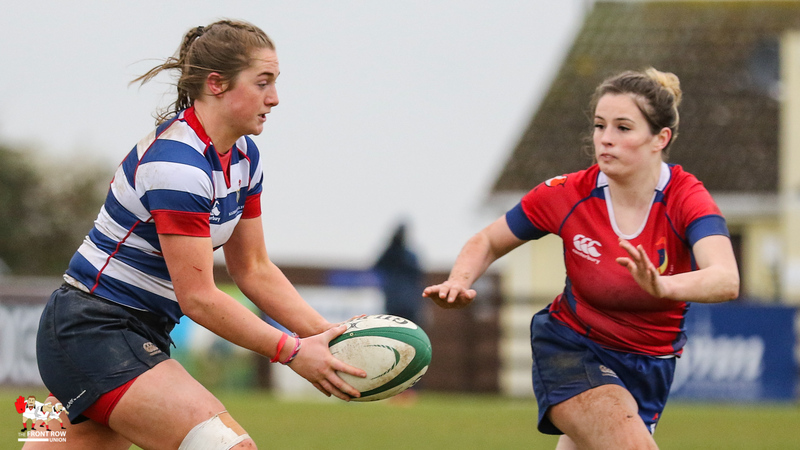 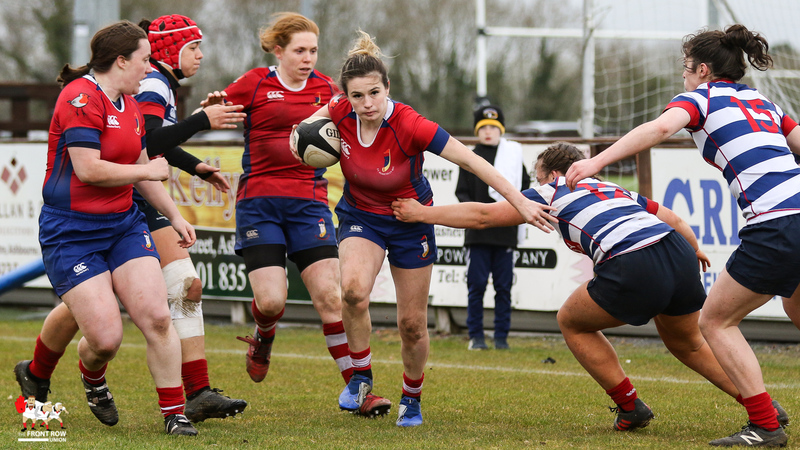 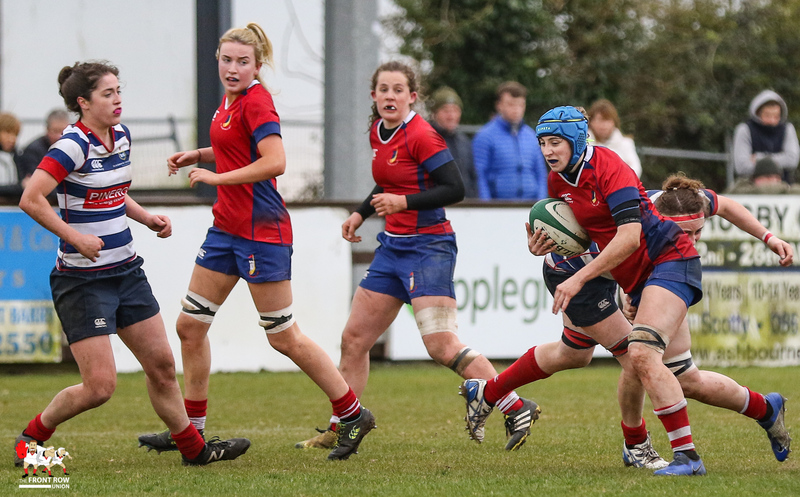 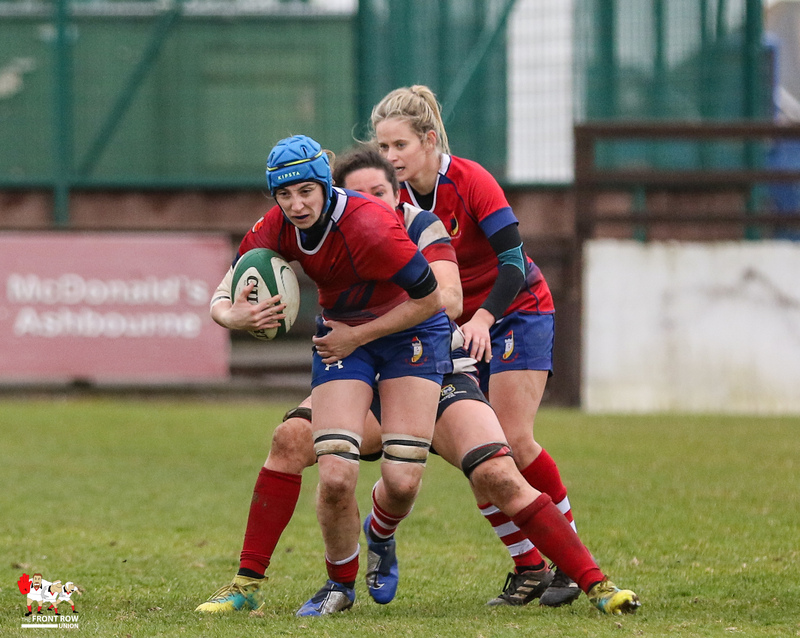 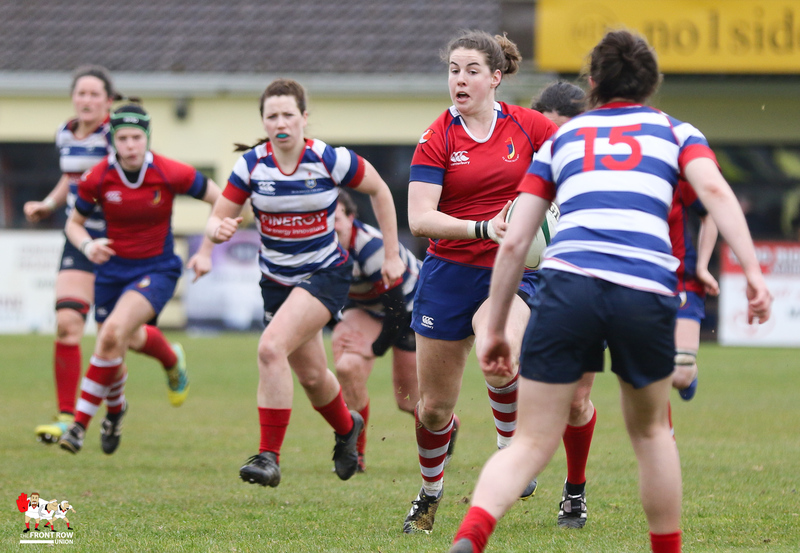 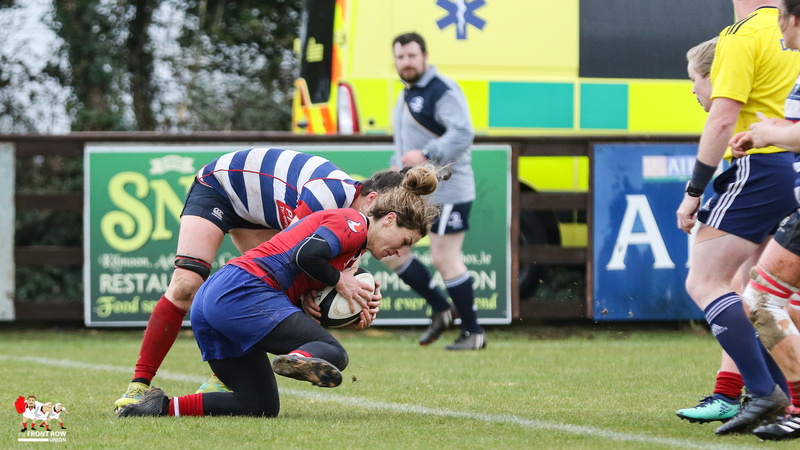 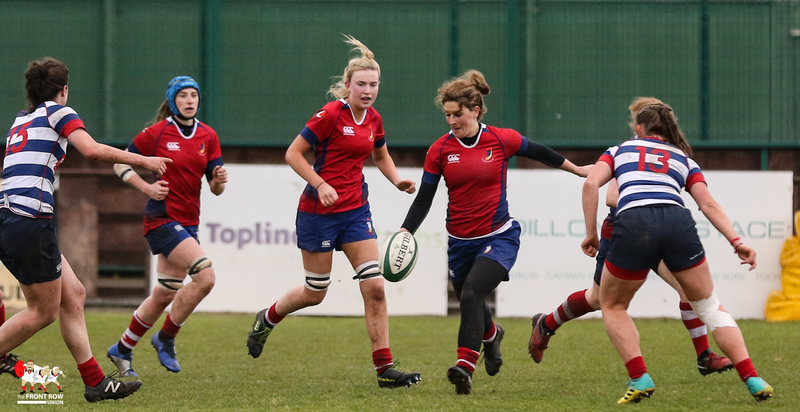 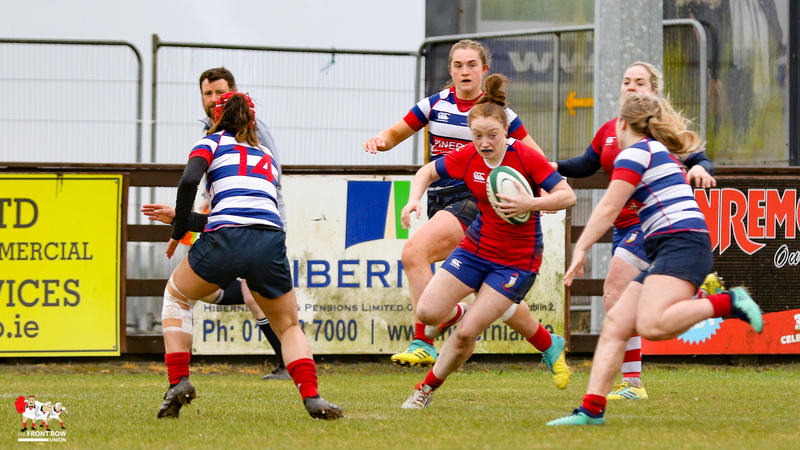 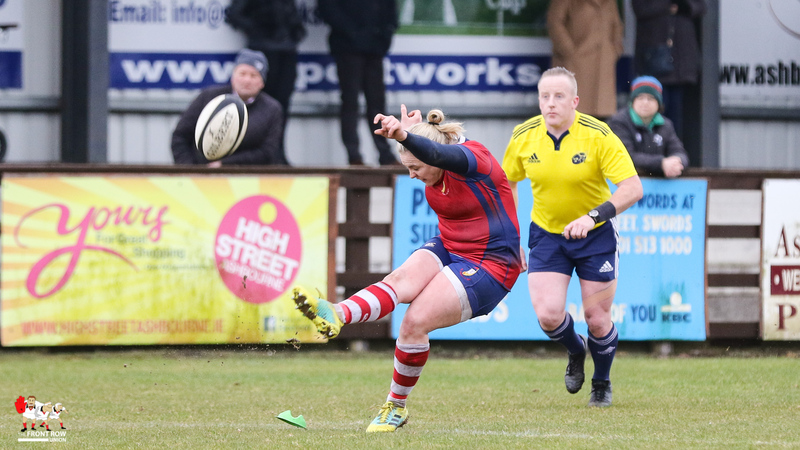 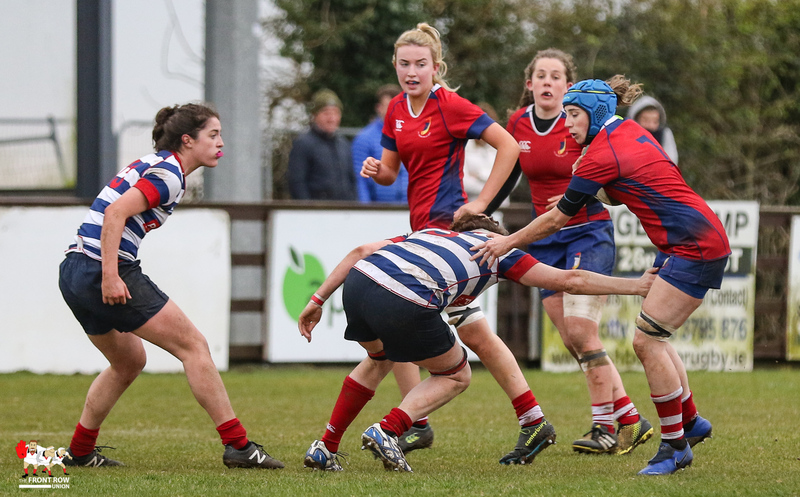 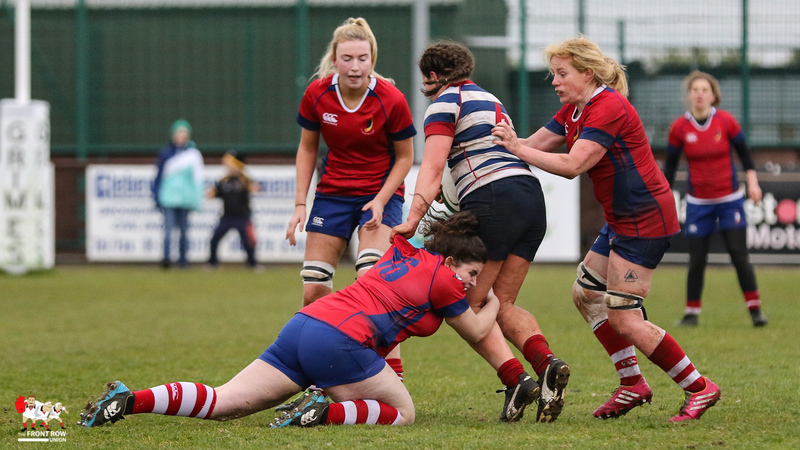 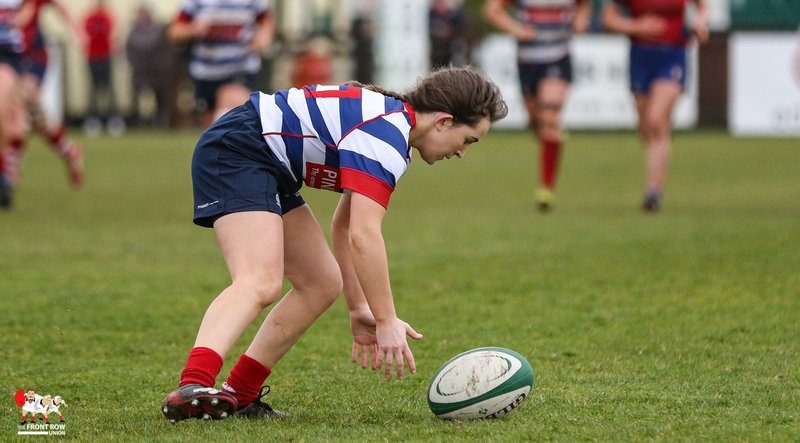 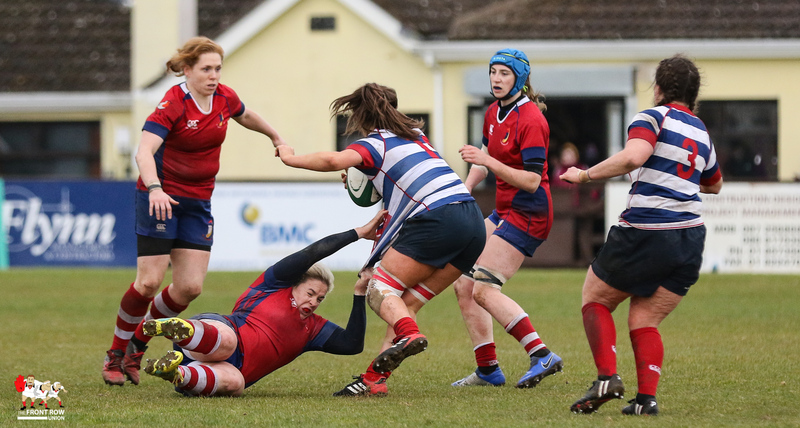 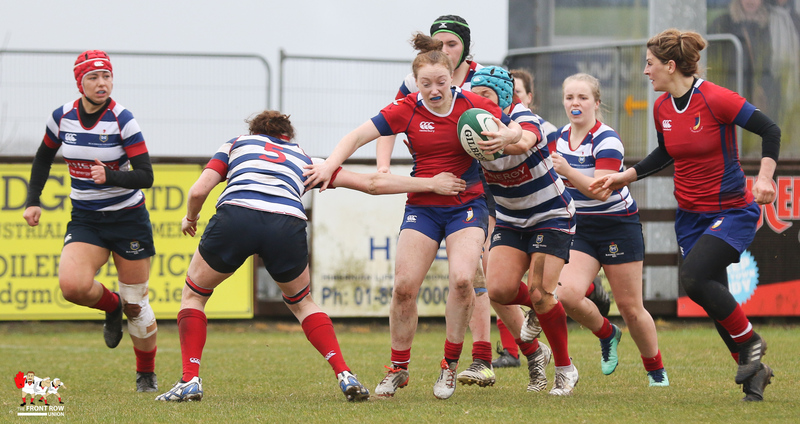 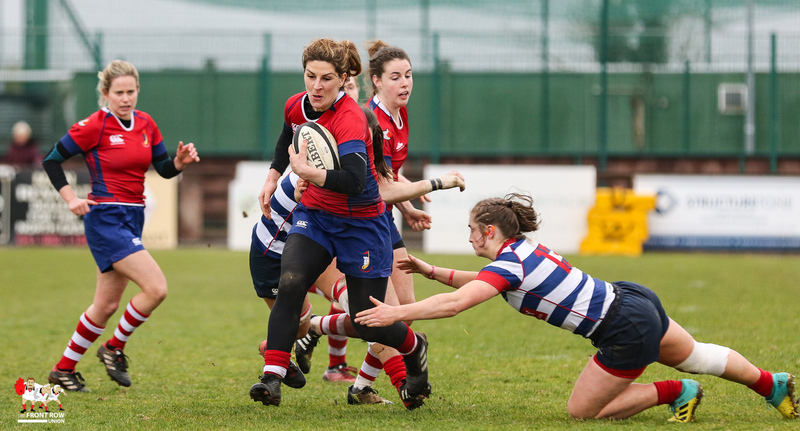 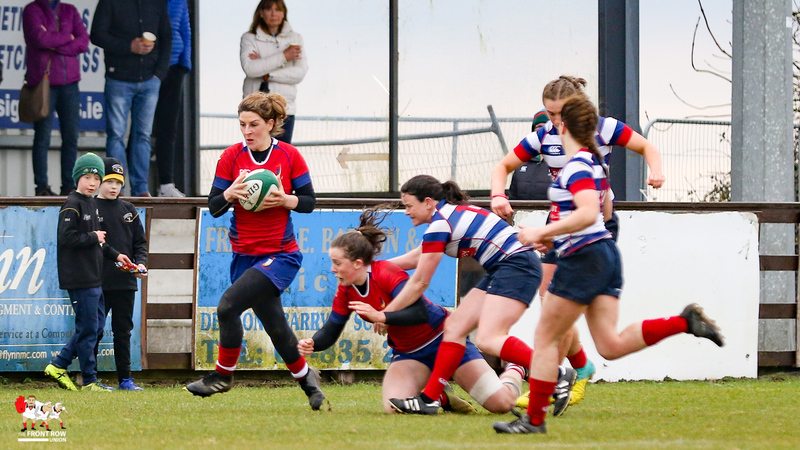 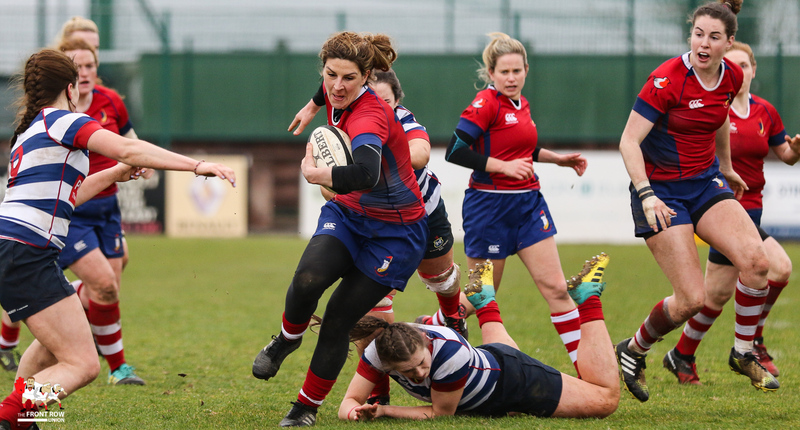 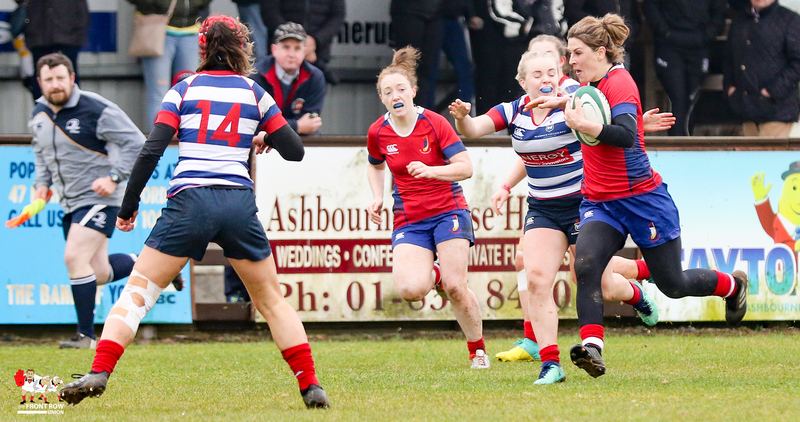 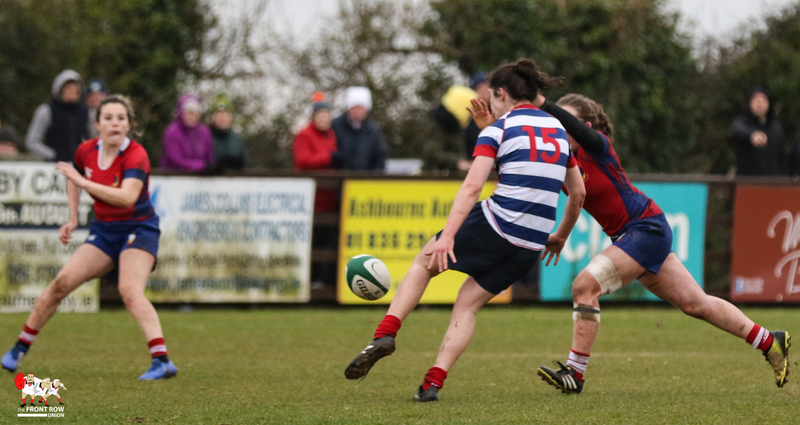 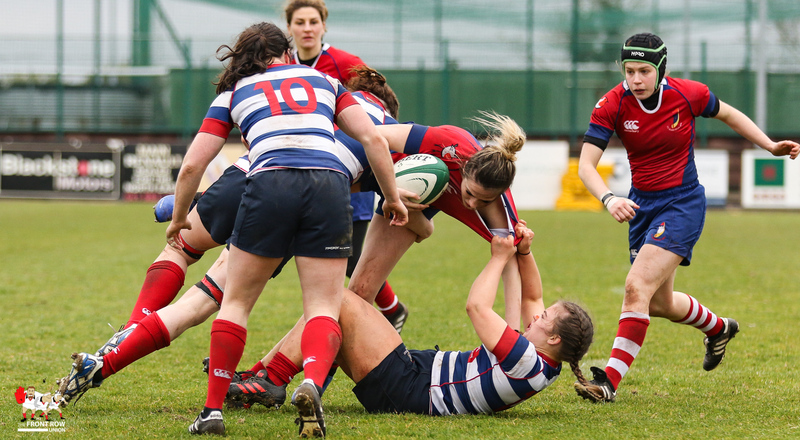 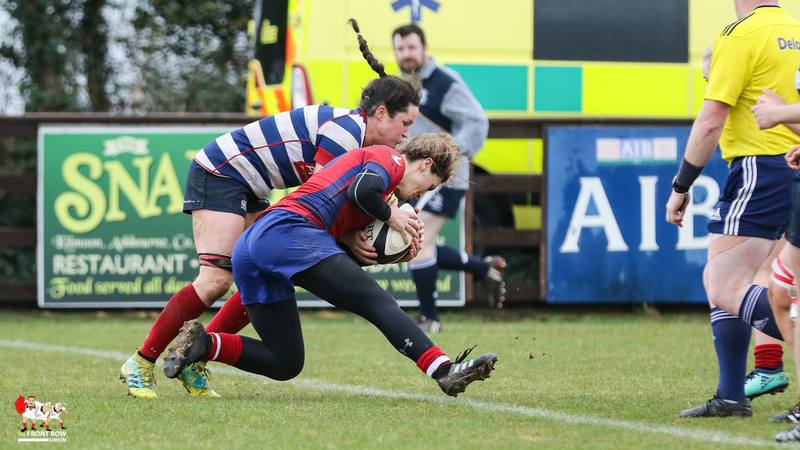 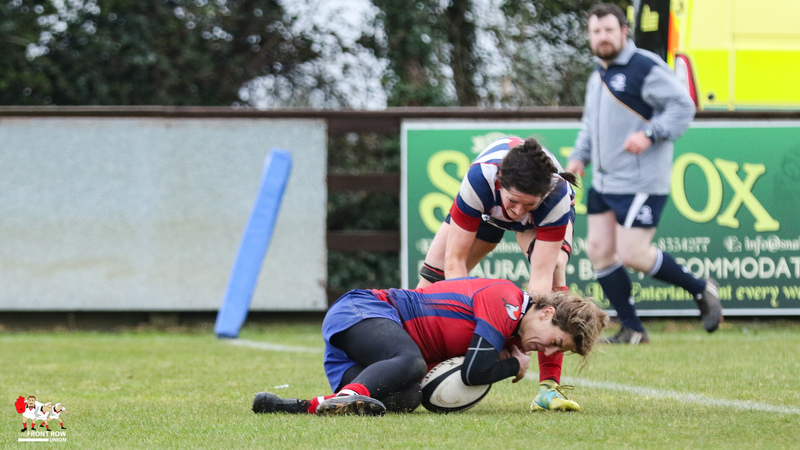 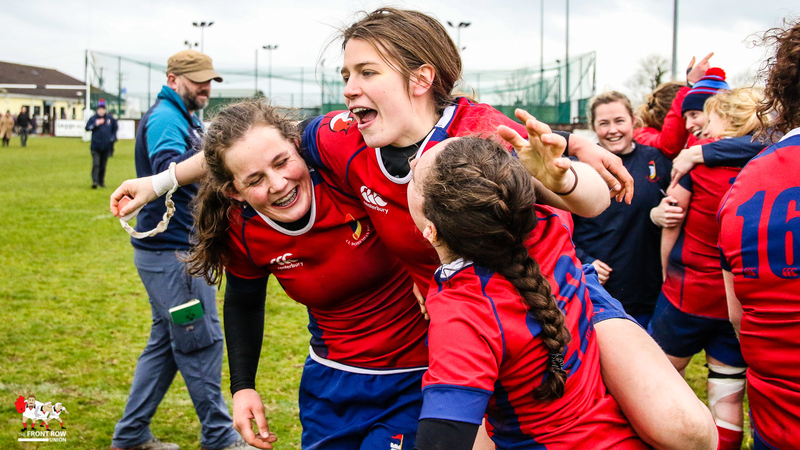 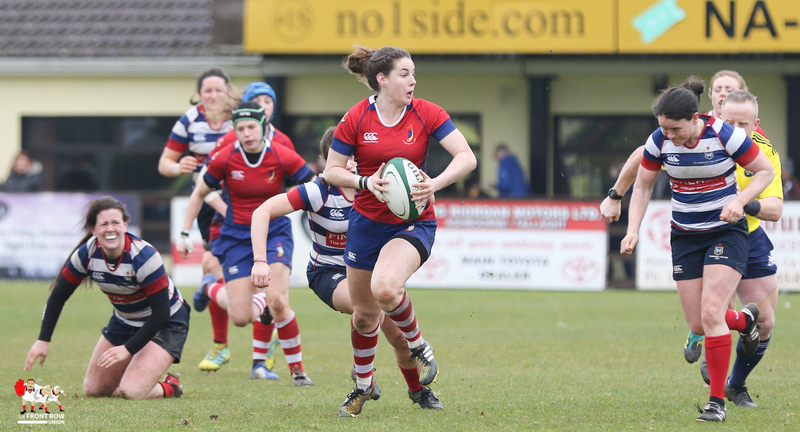 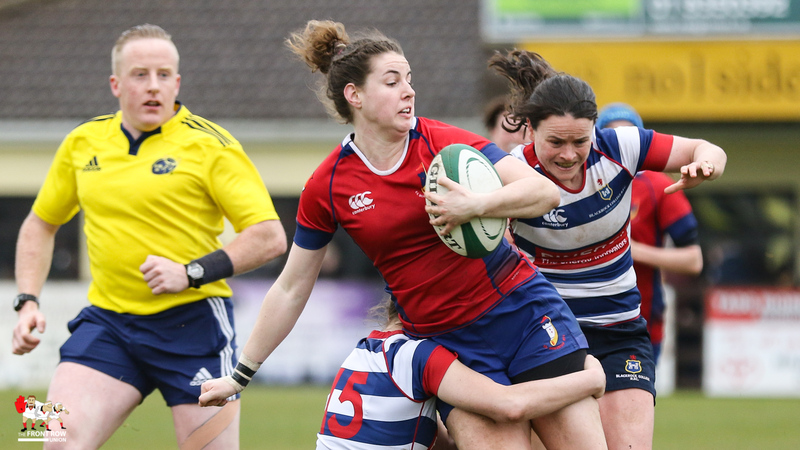 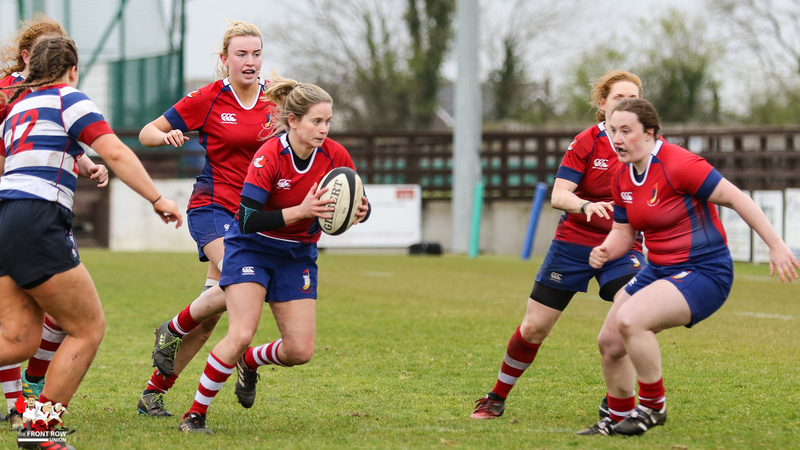 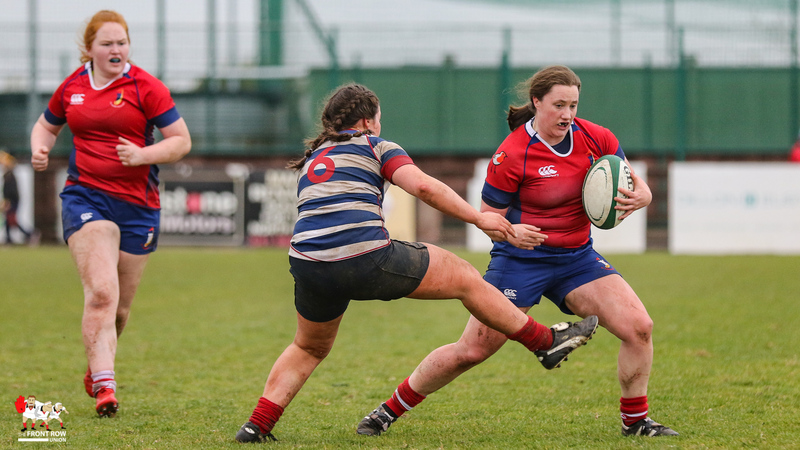 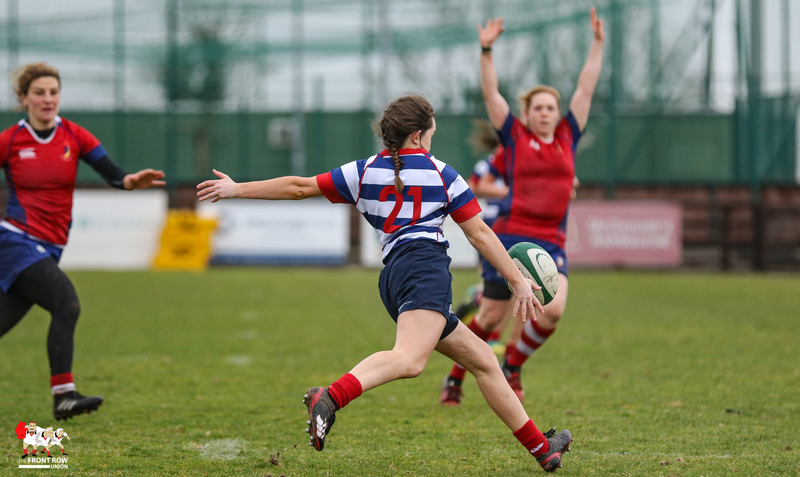 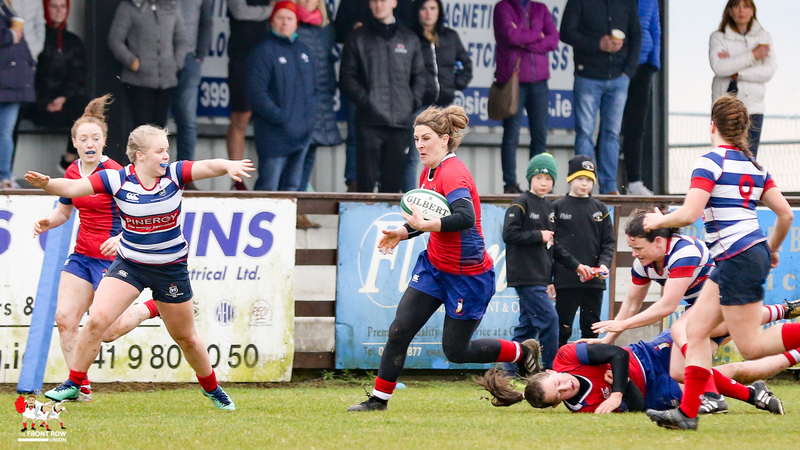 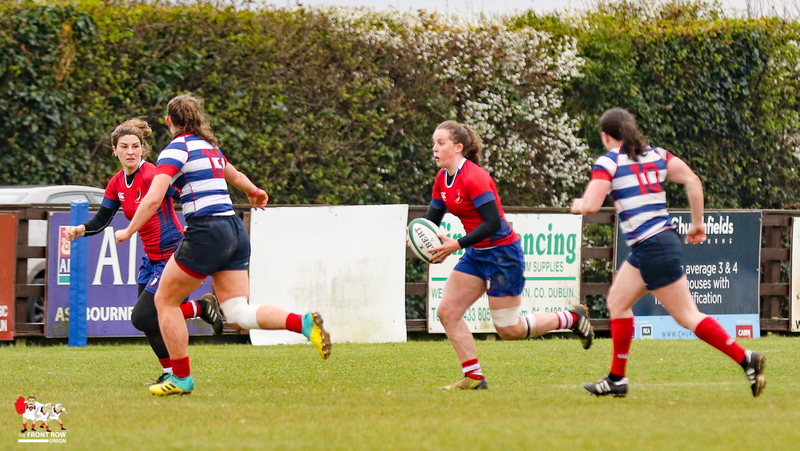 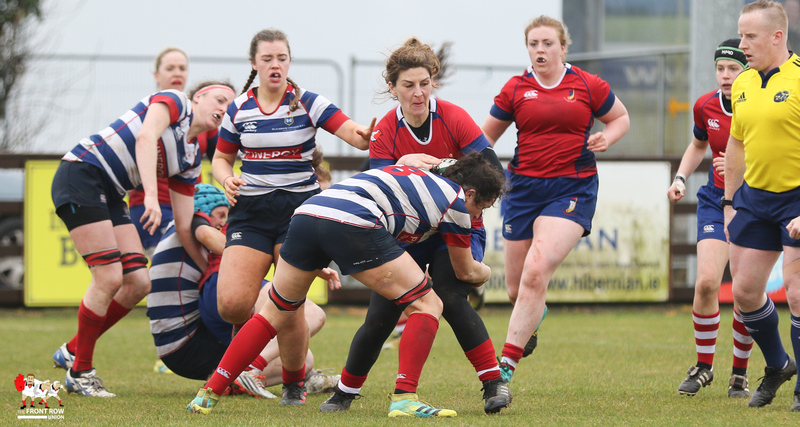 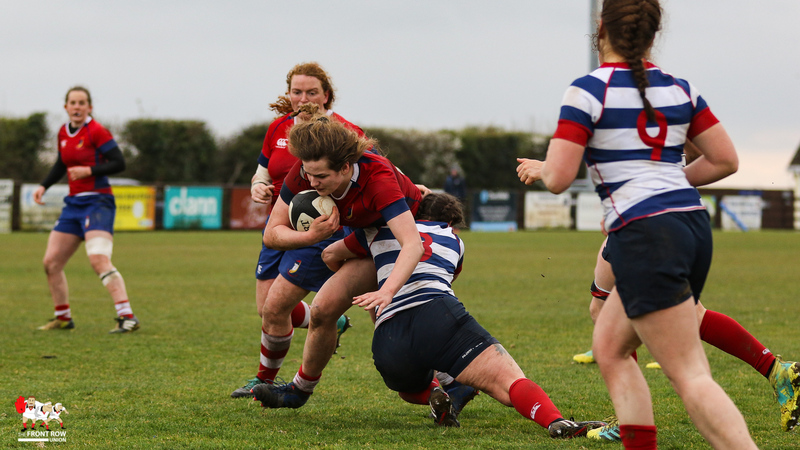 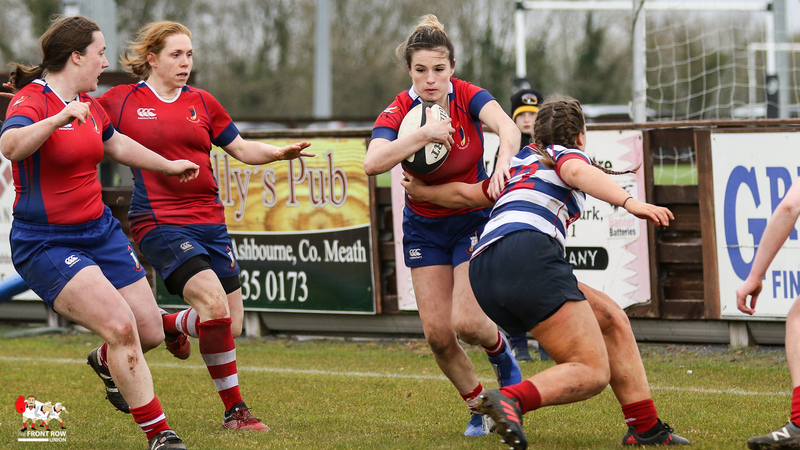 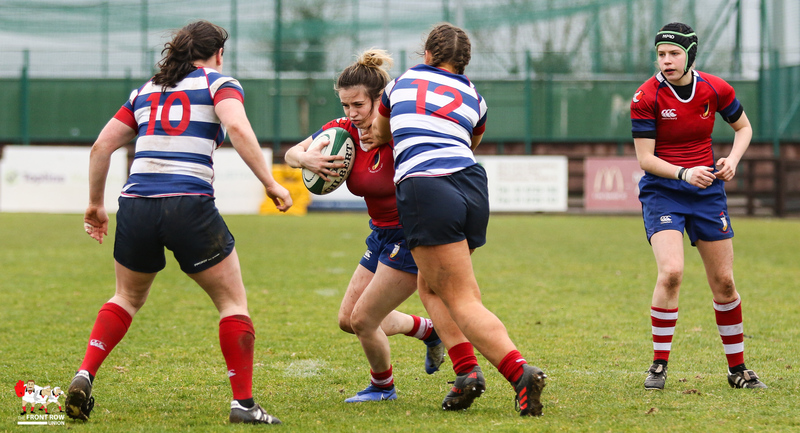 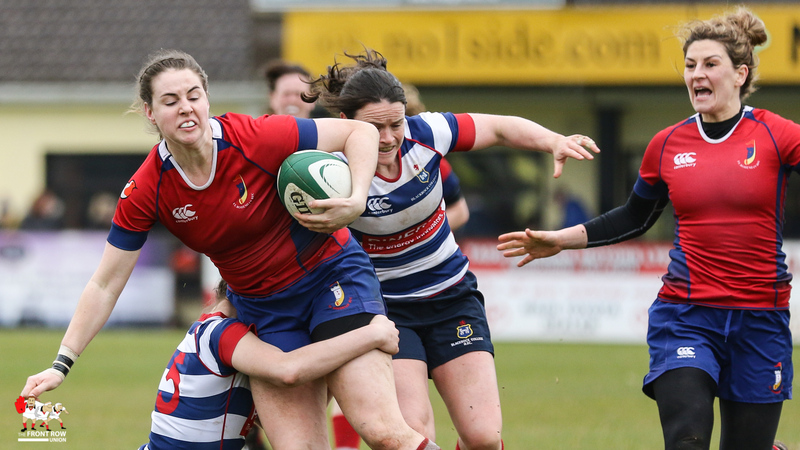 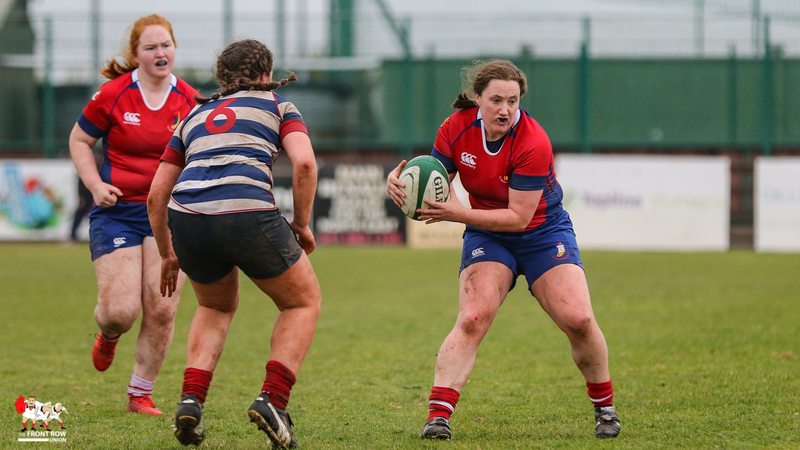 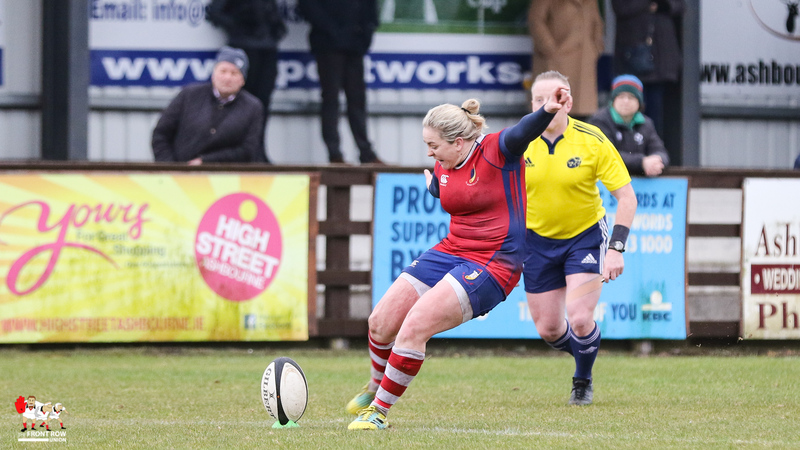 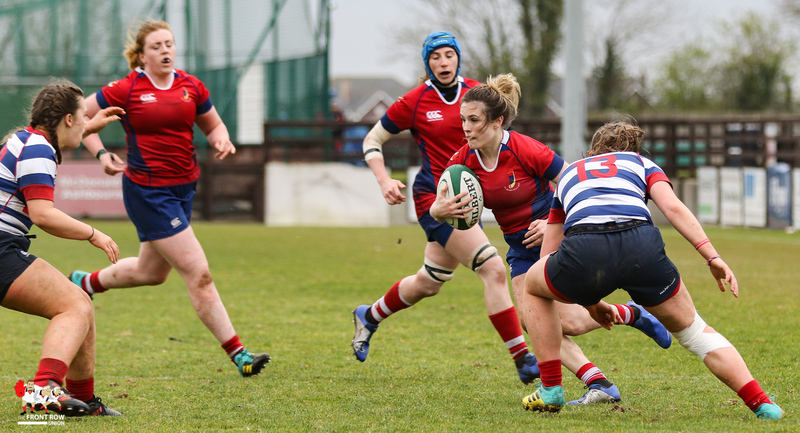 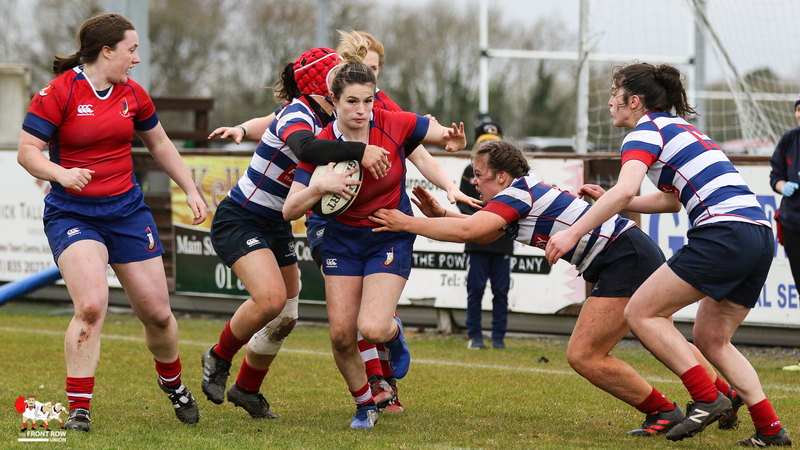 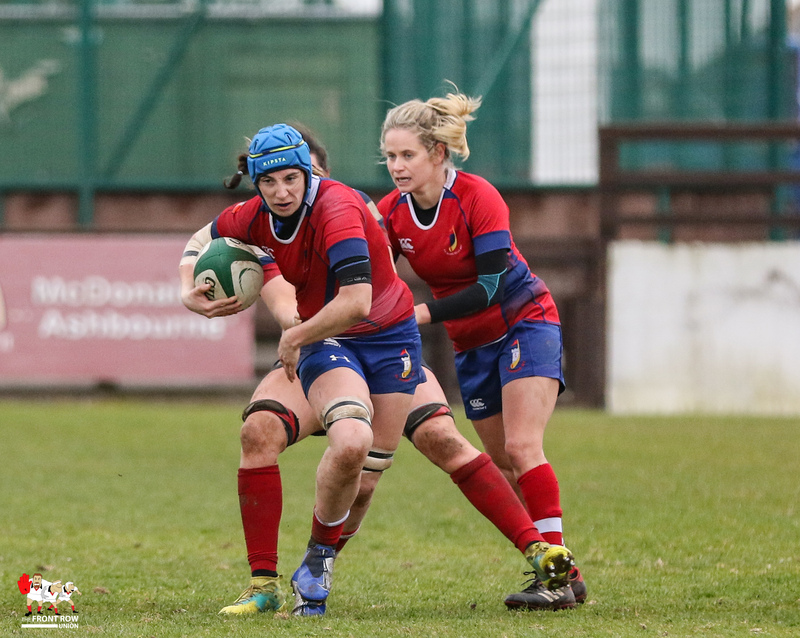 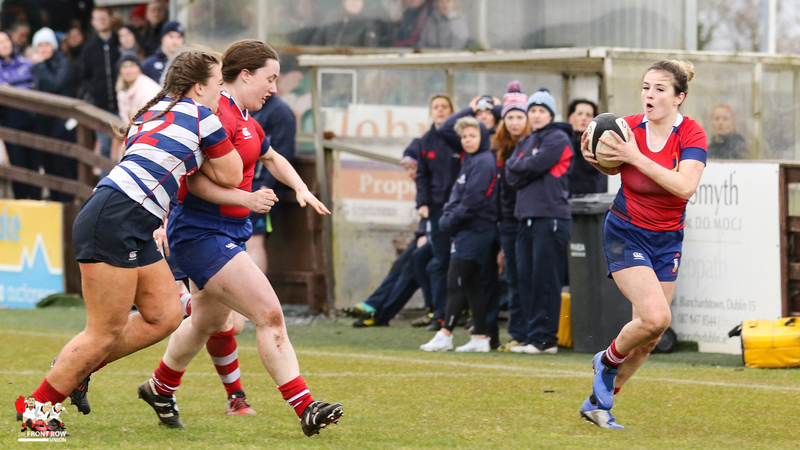 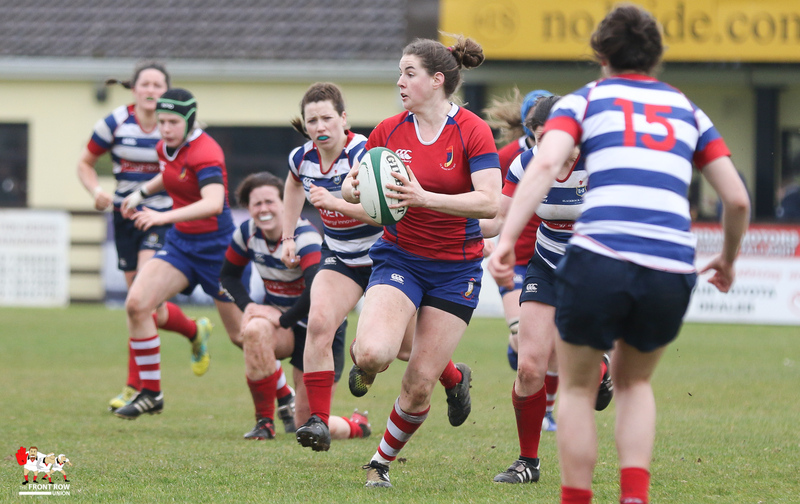 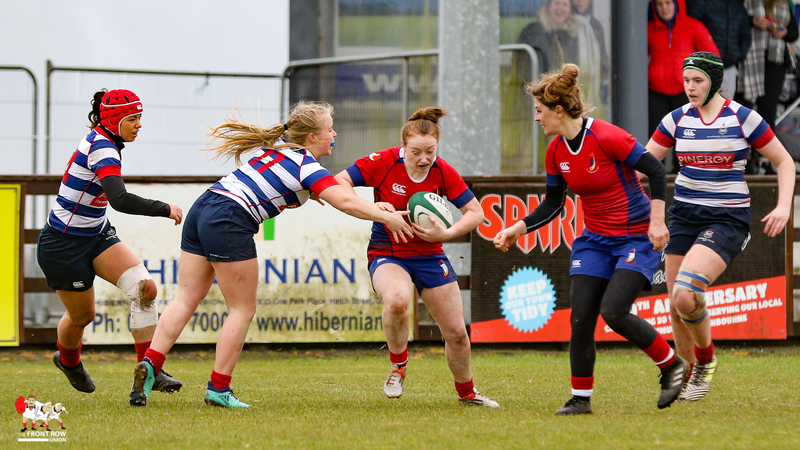 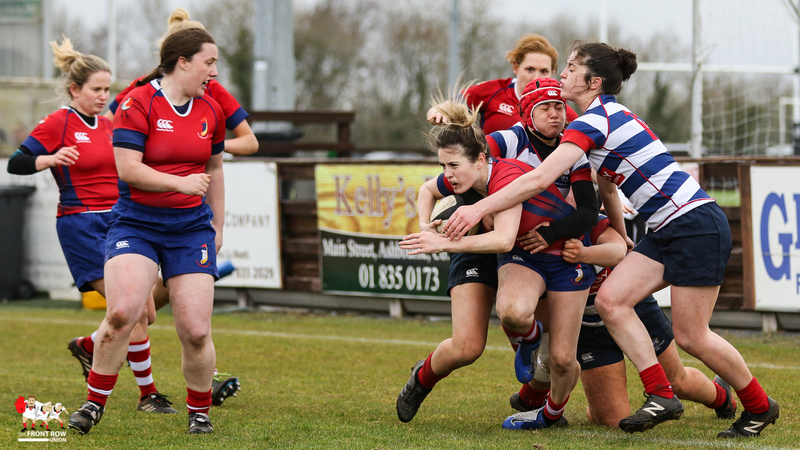 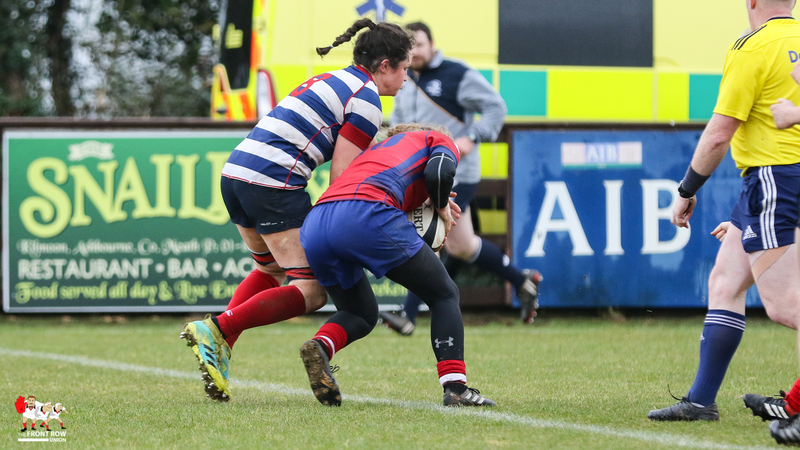 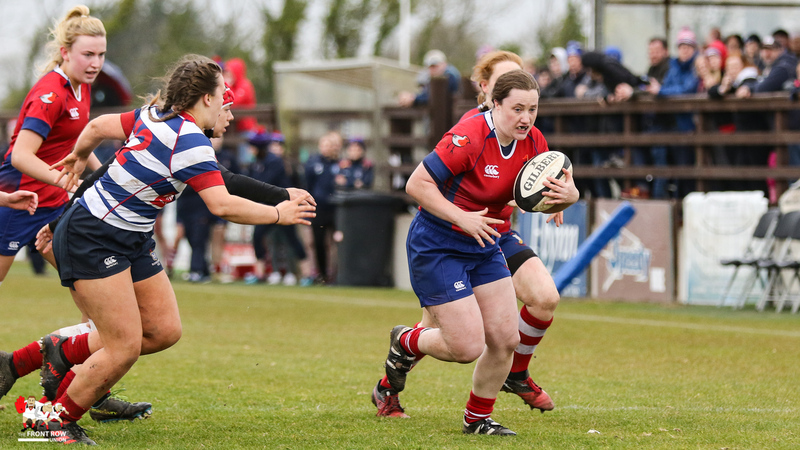 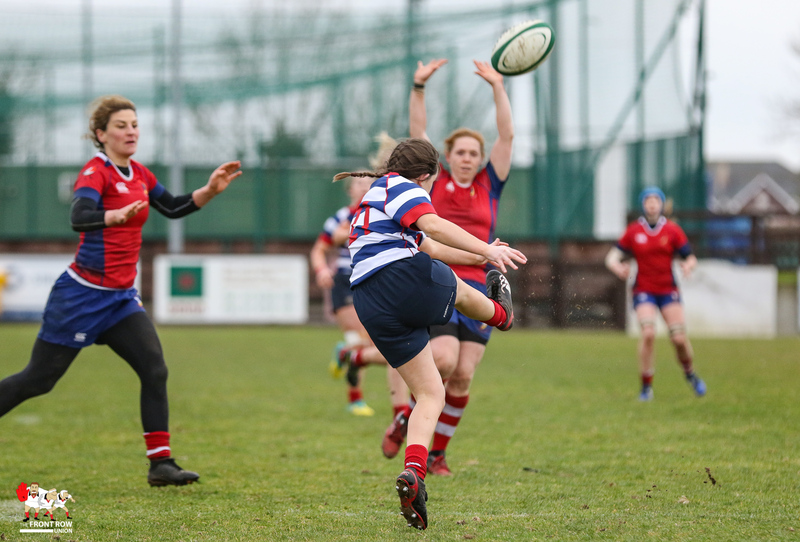 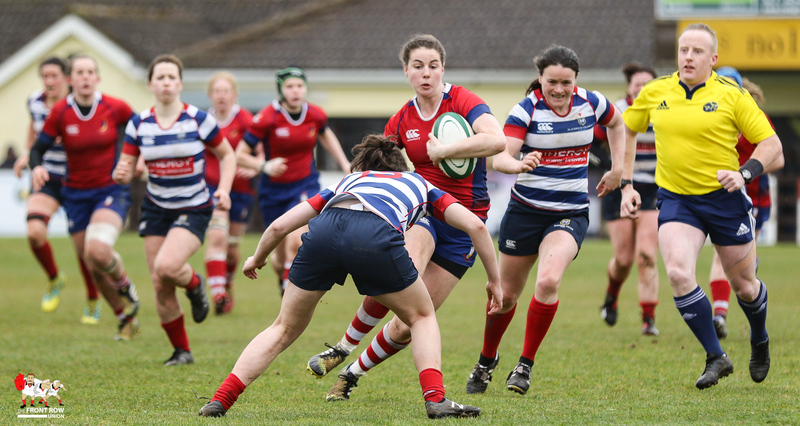 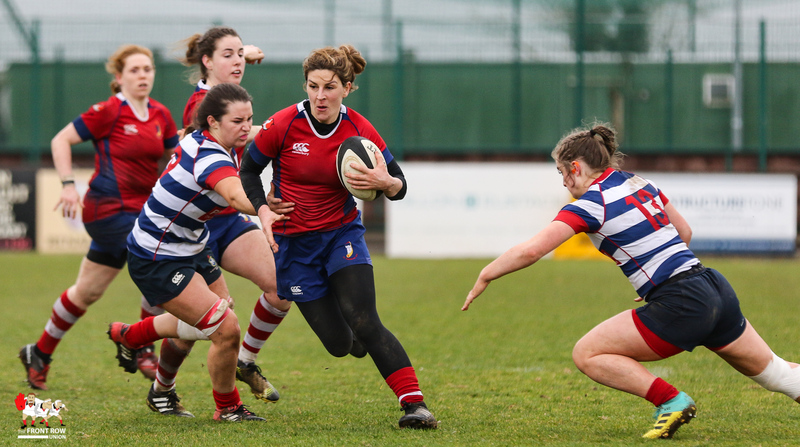 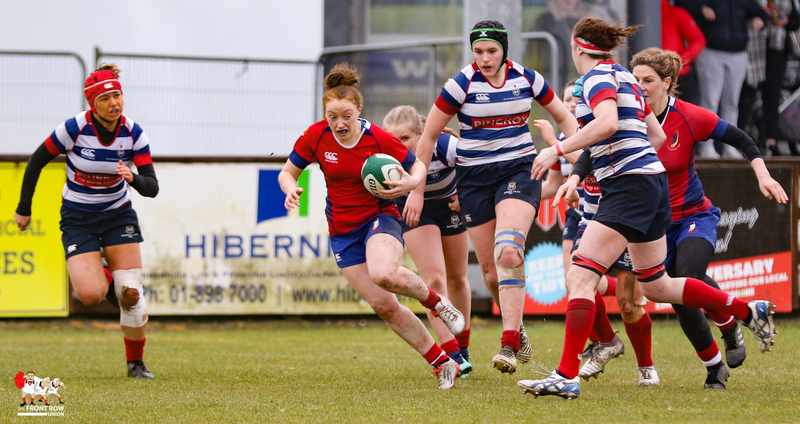 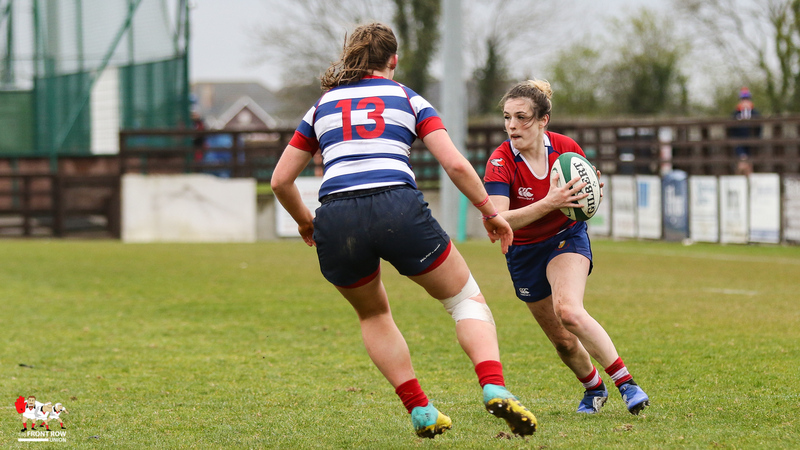 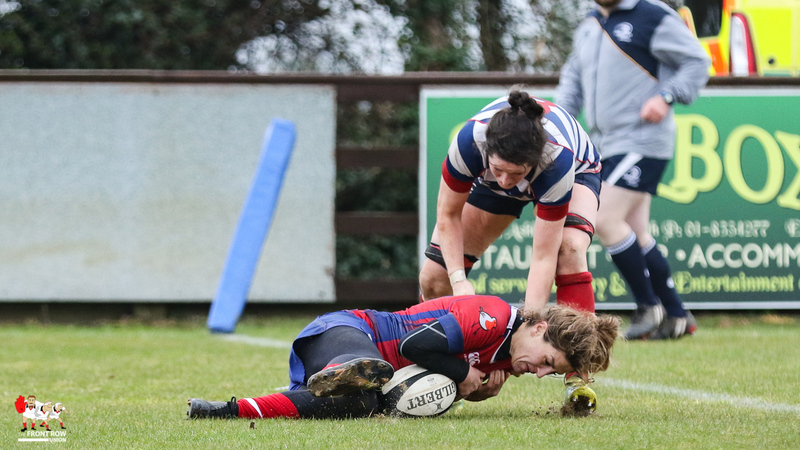 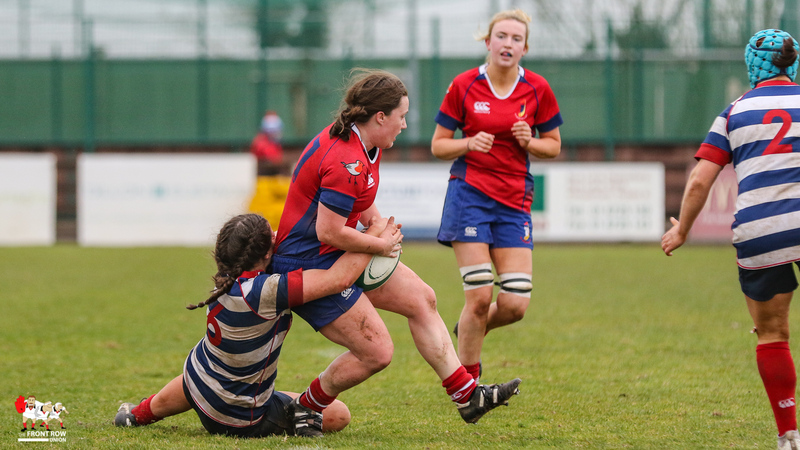 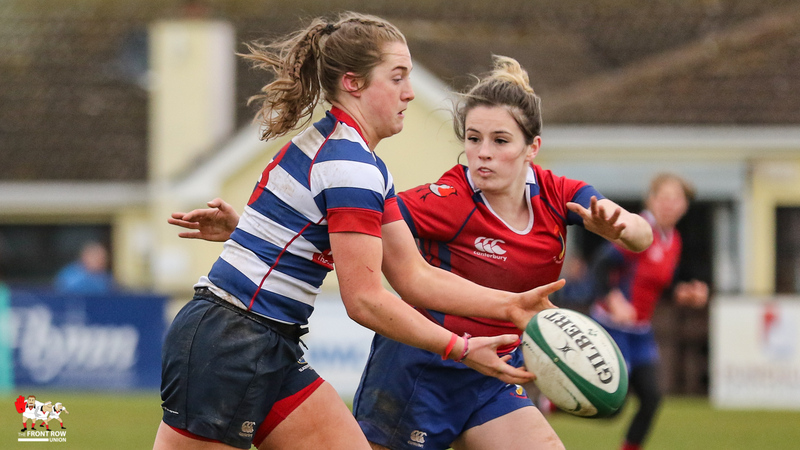 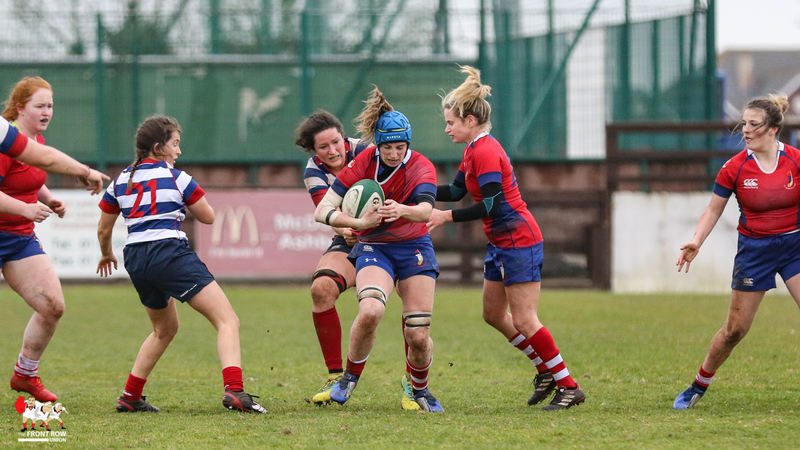 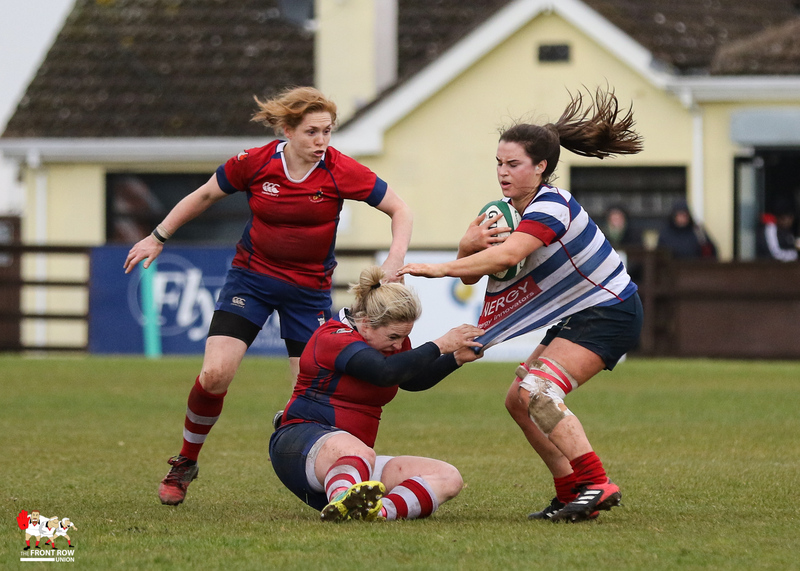 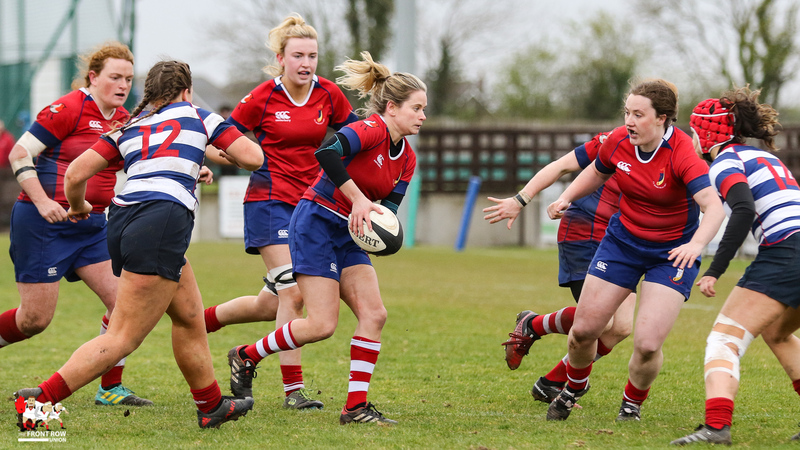 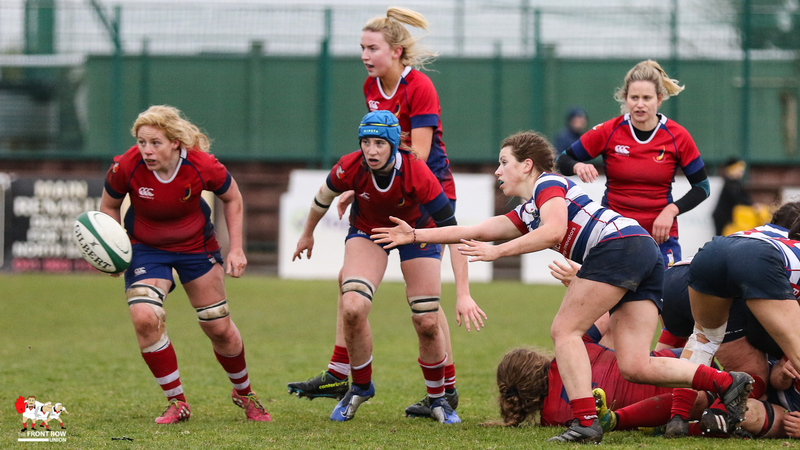 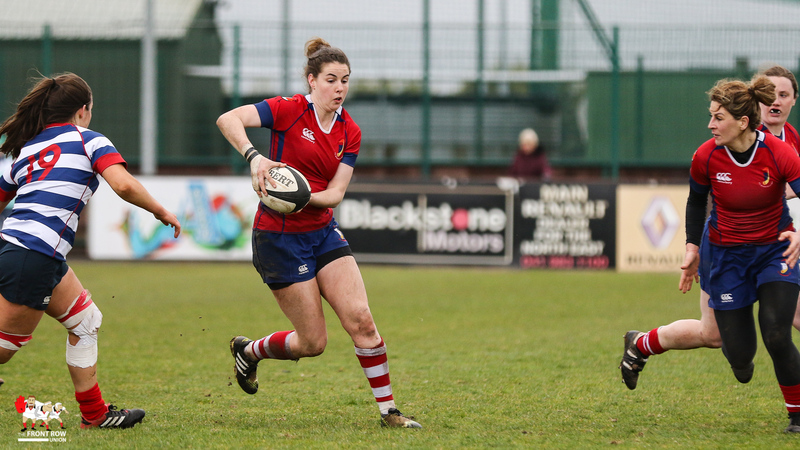 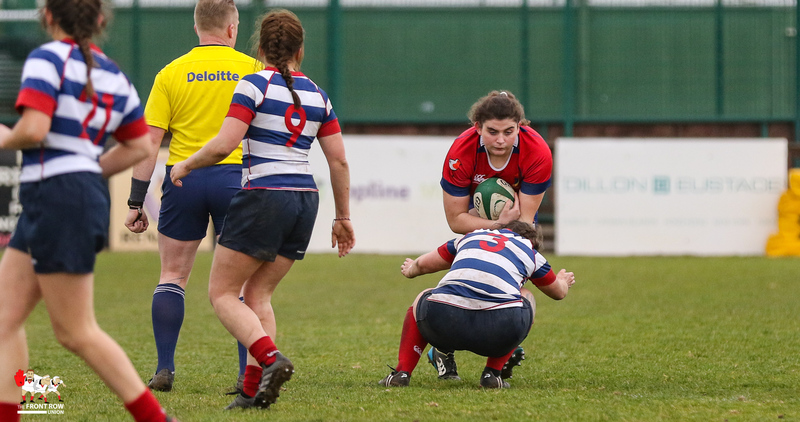 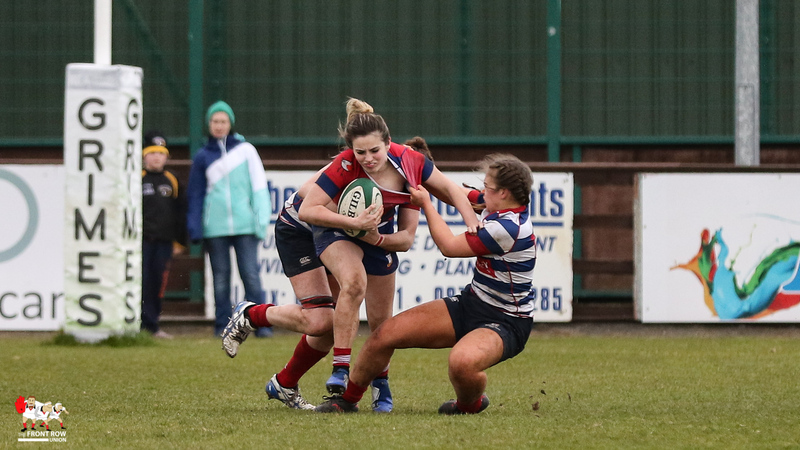 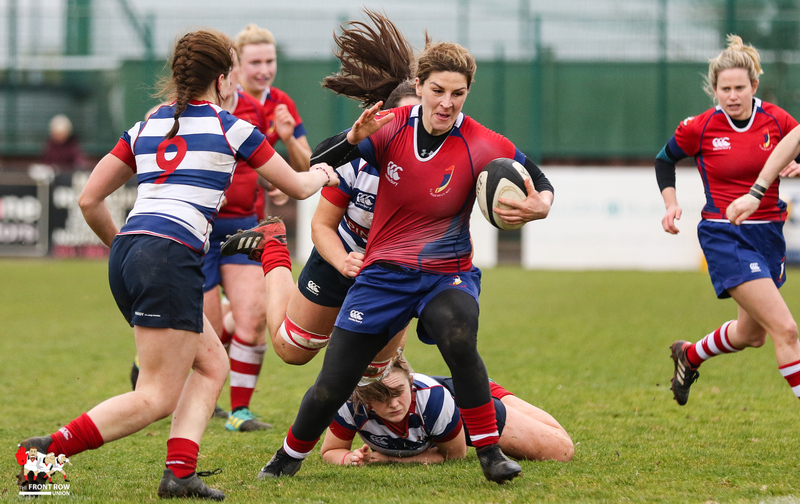 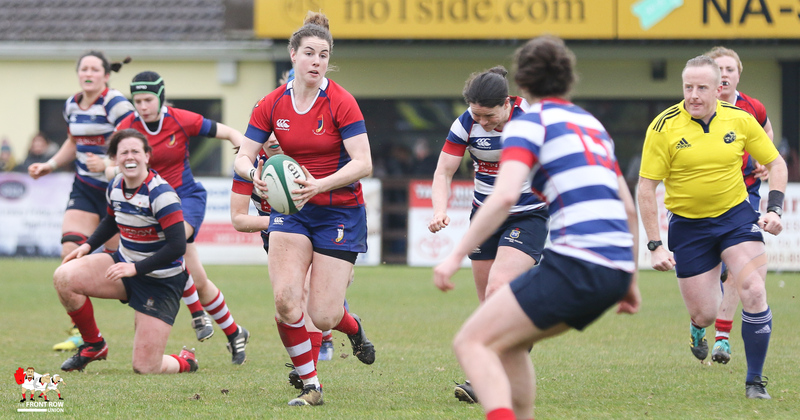 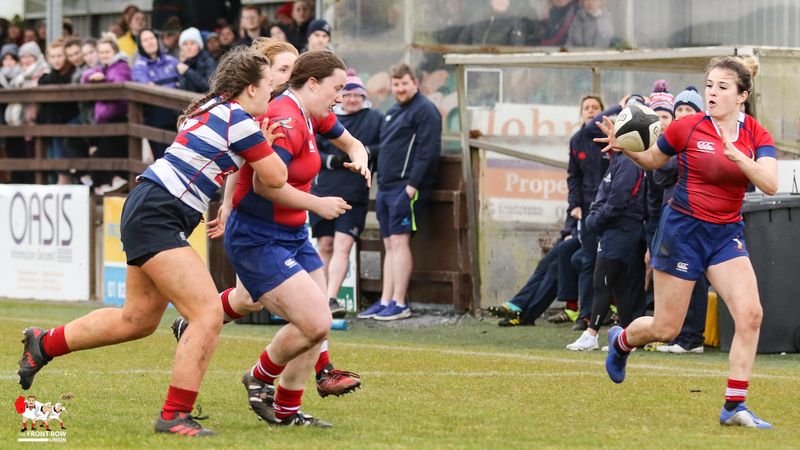 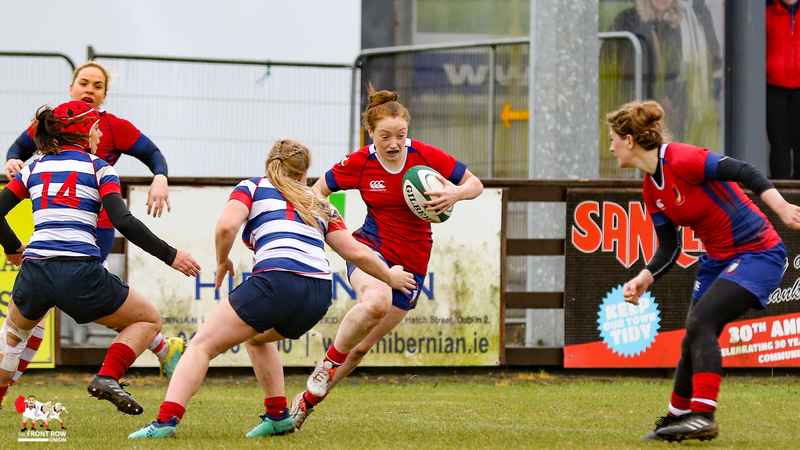 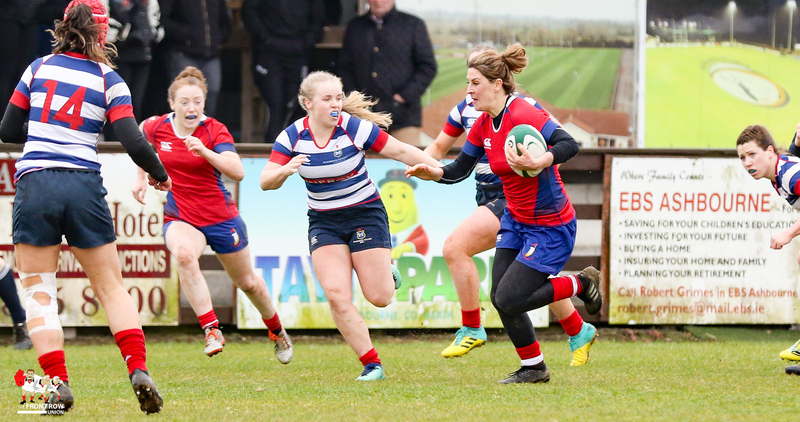 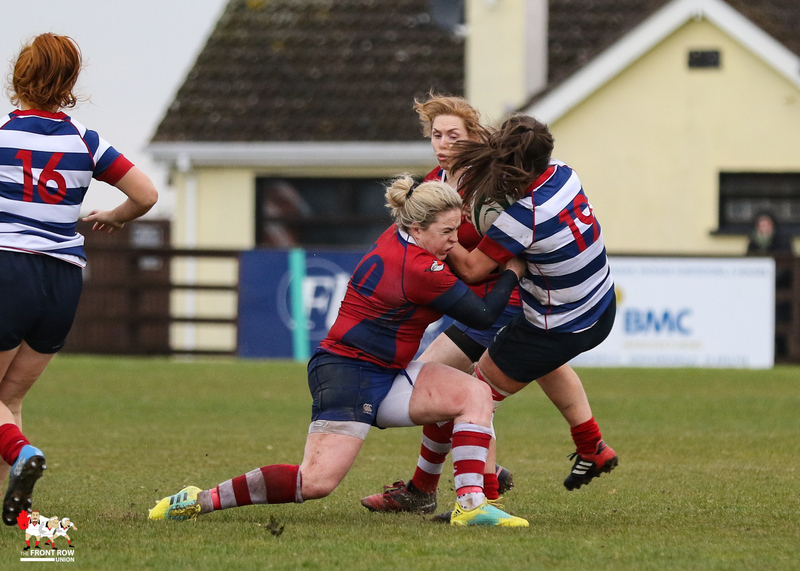 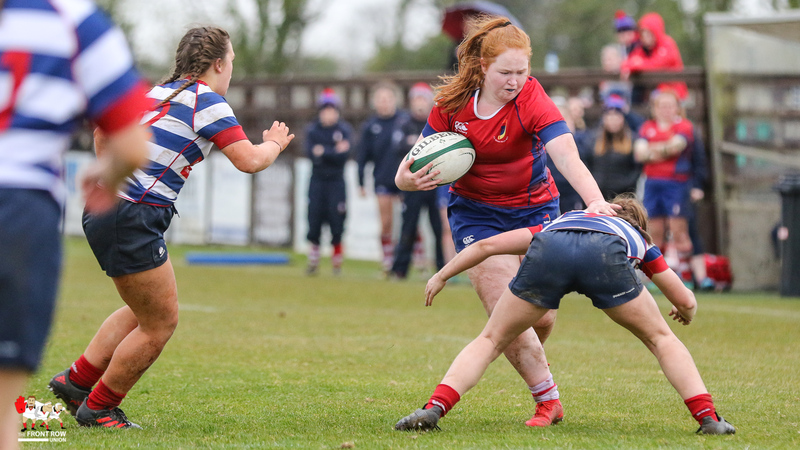 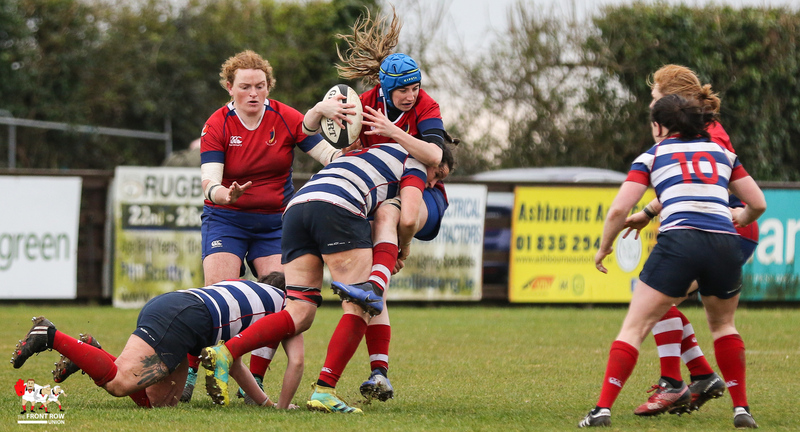 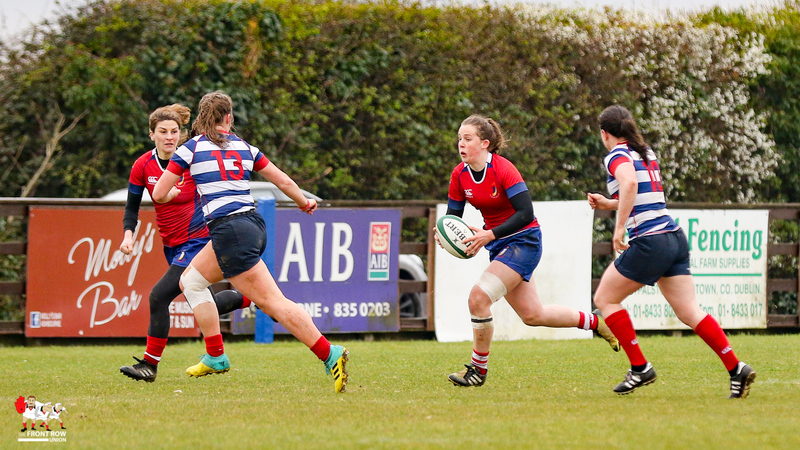 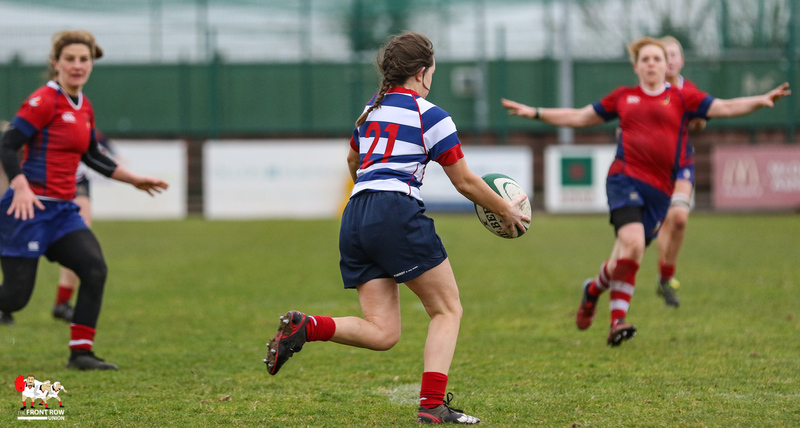 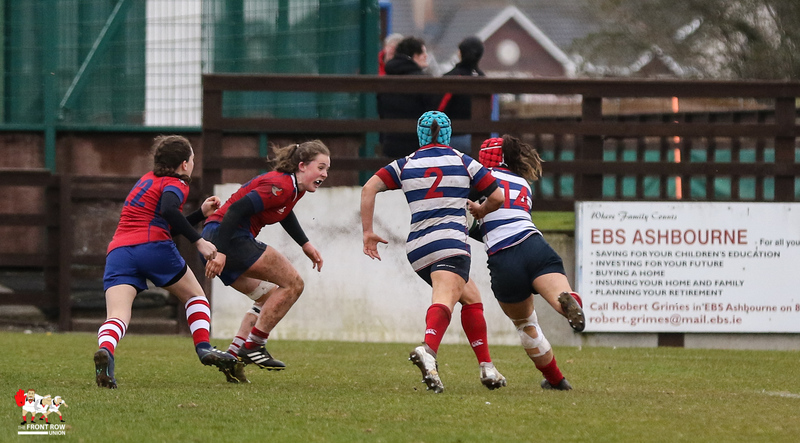 Aine Staunton scores the decisive try for UL Bohemian. 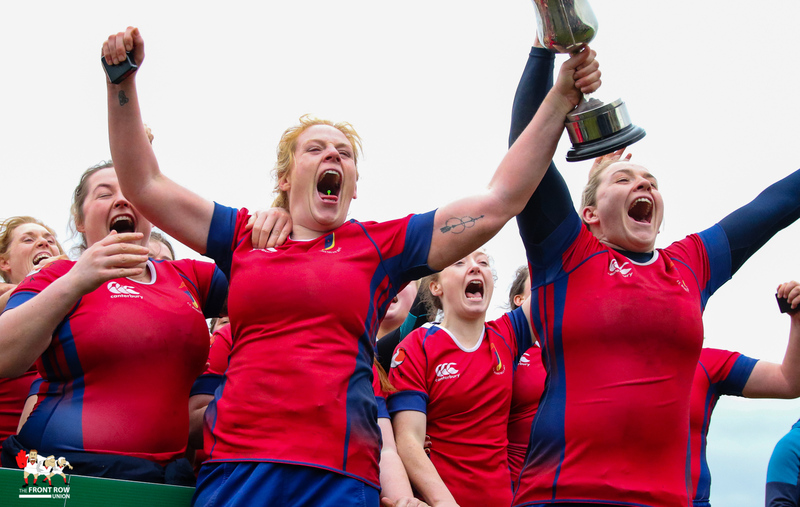 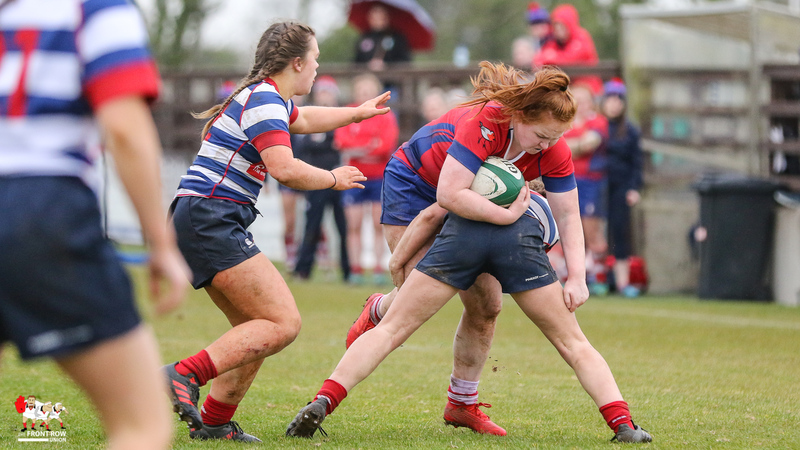 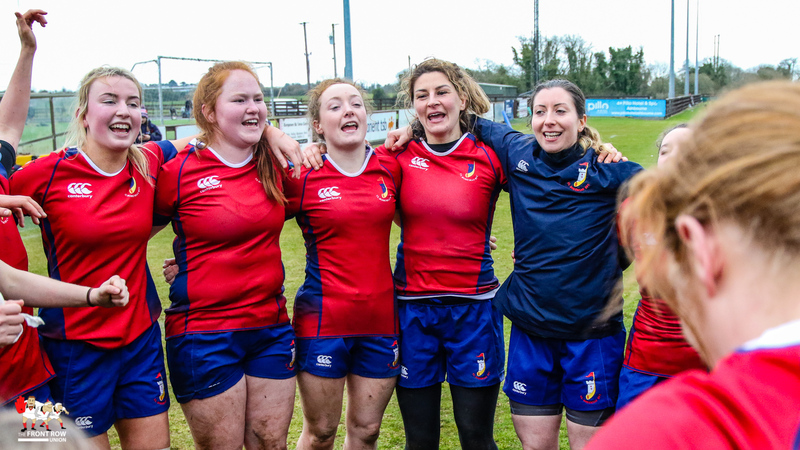 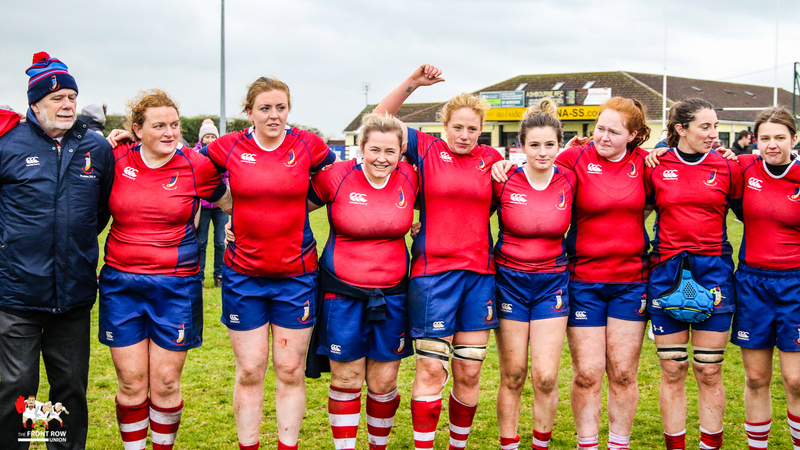 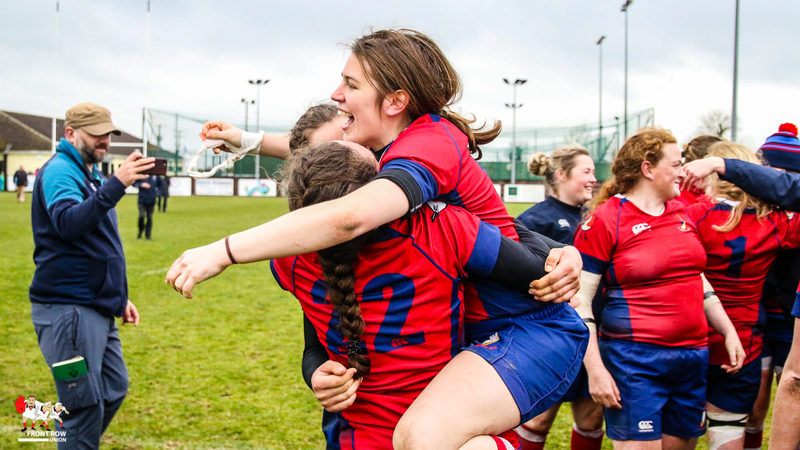 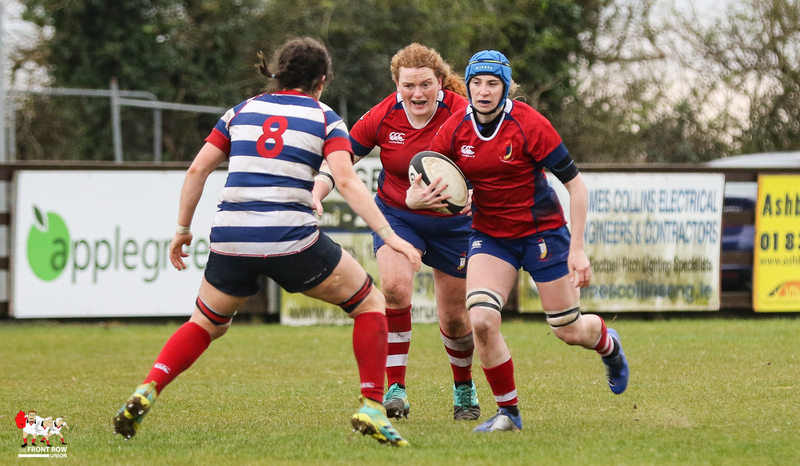 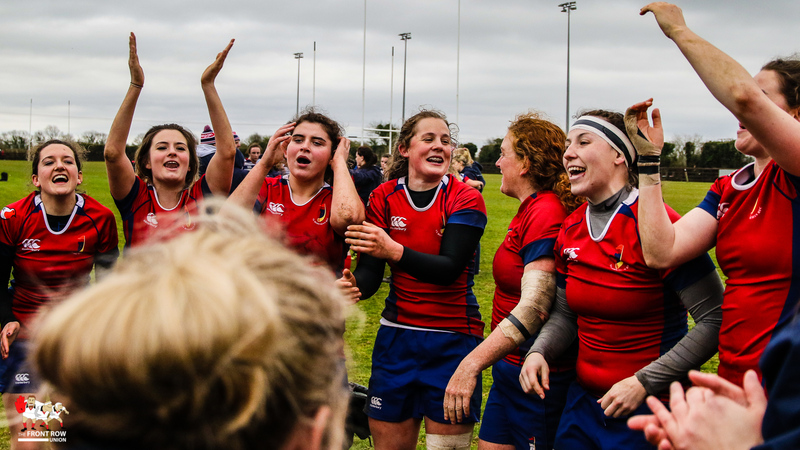 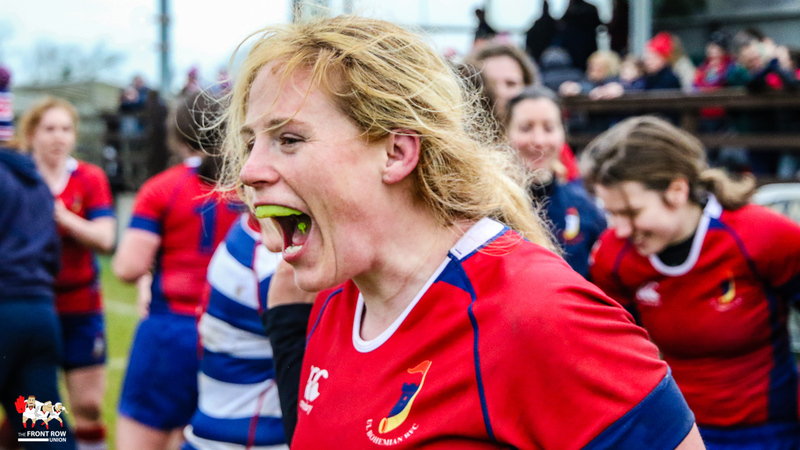 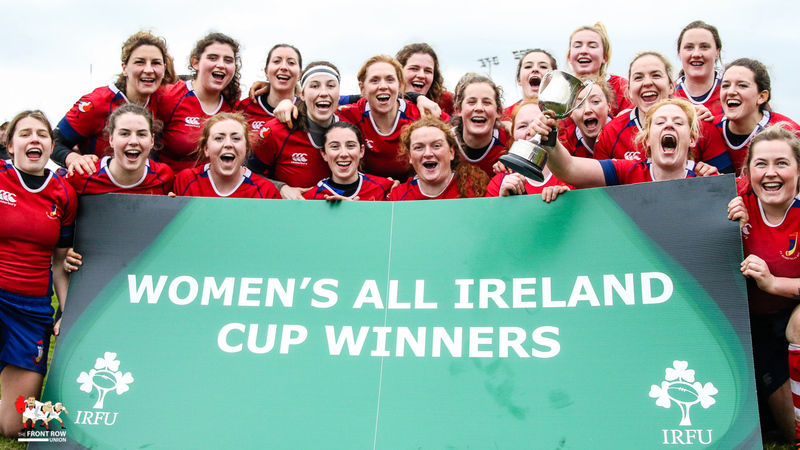 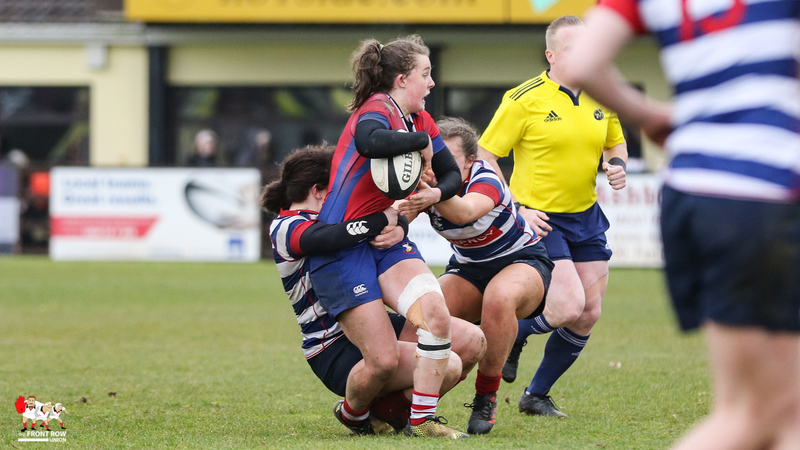 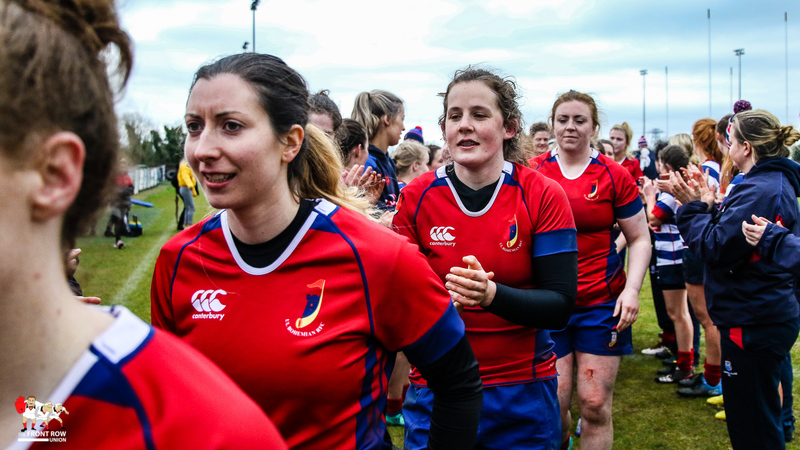 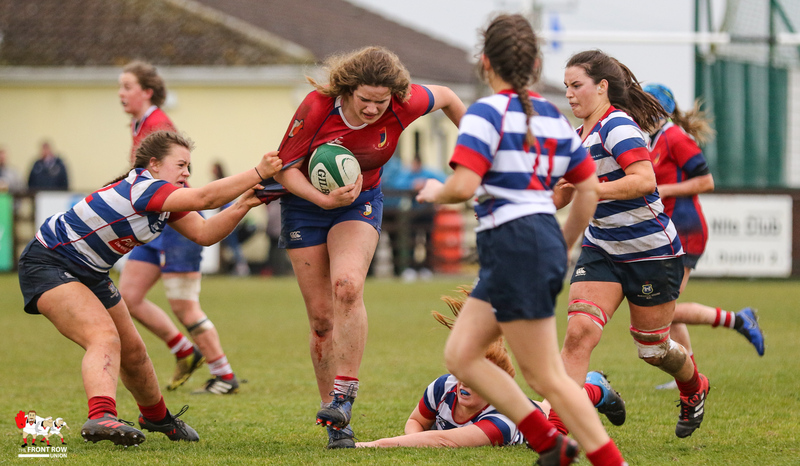 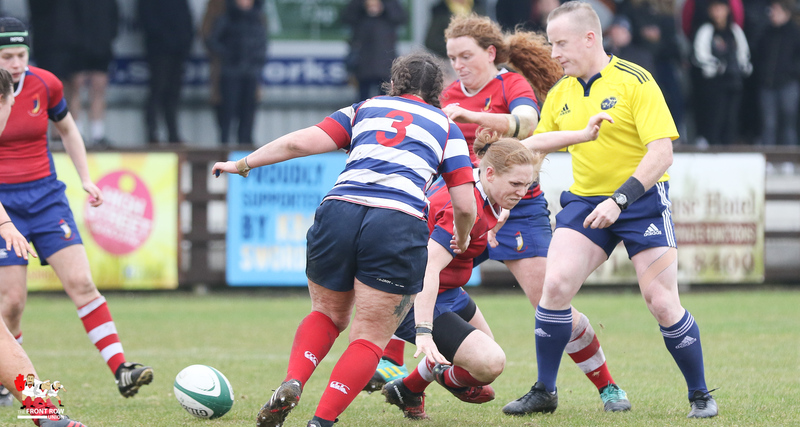 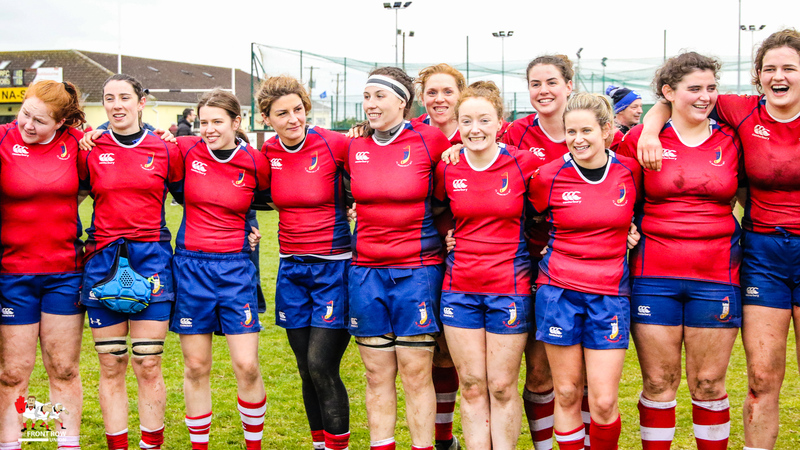 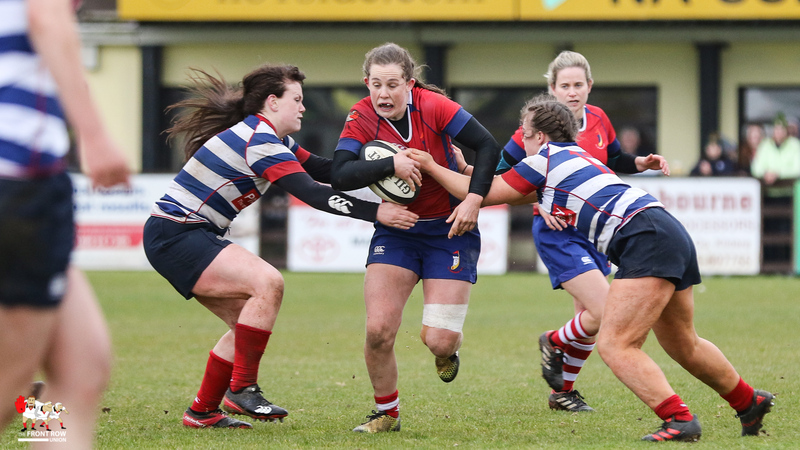 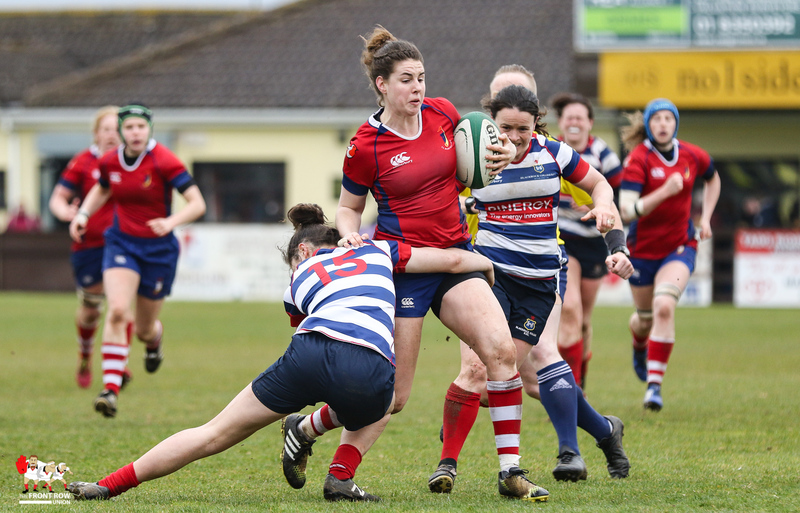 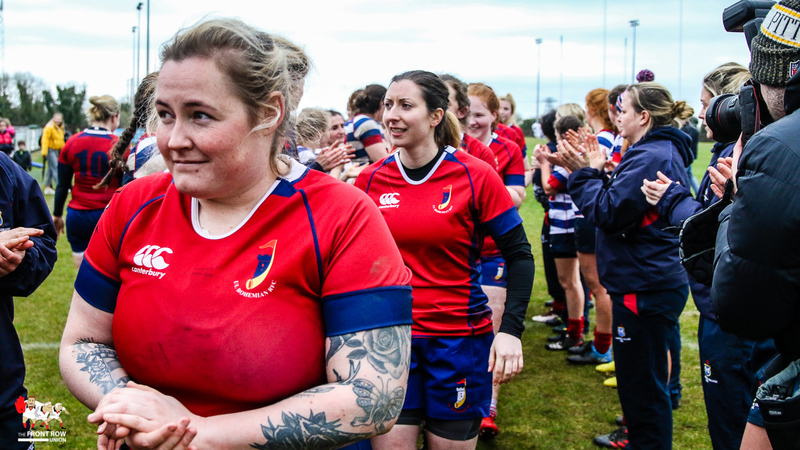 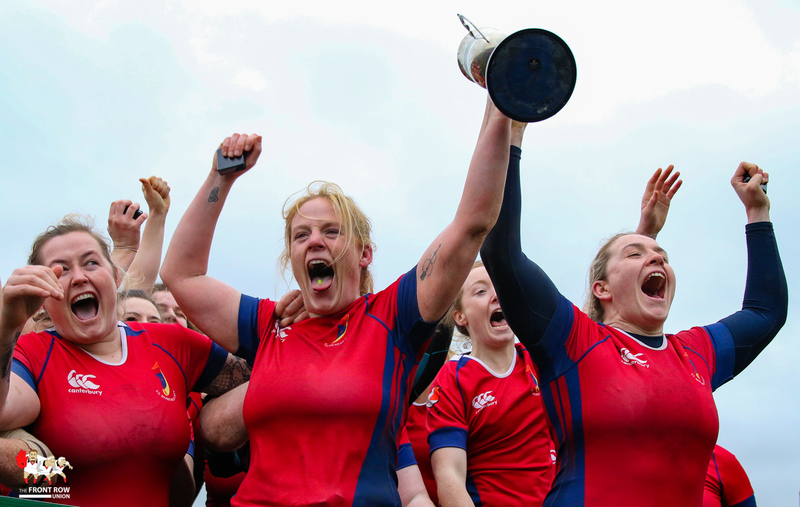 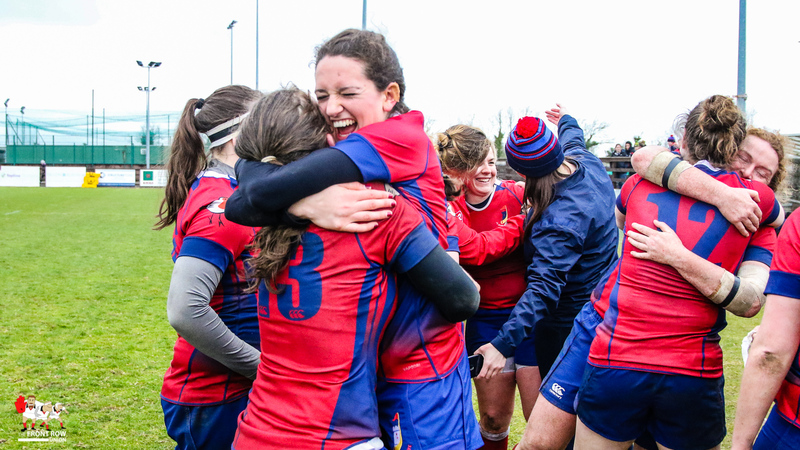 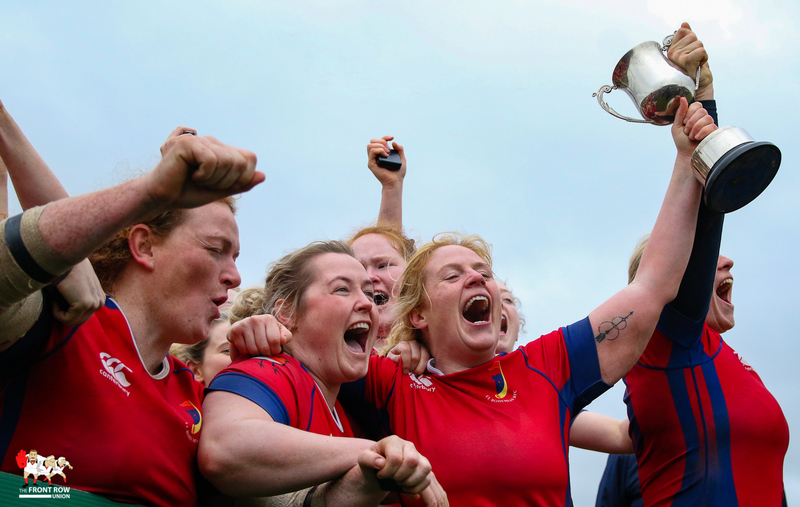 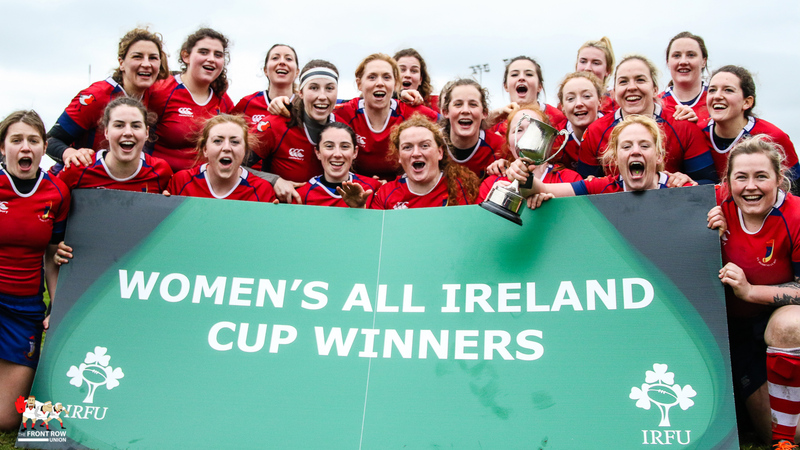 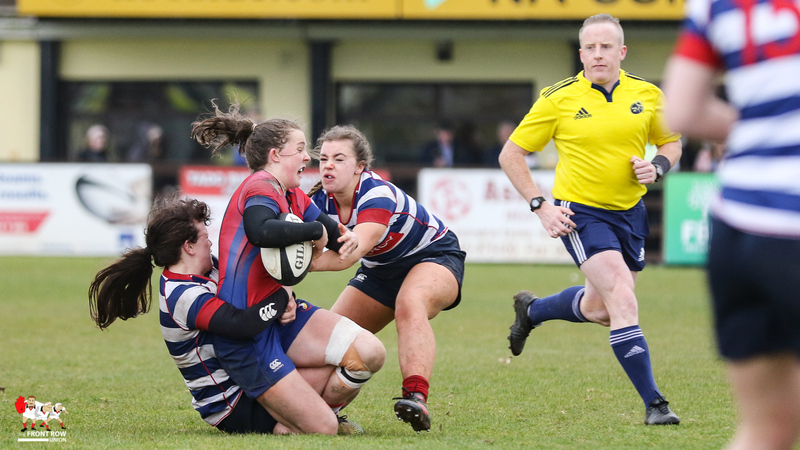 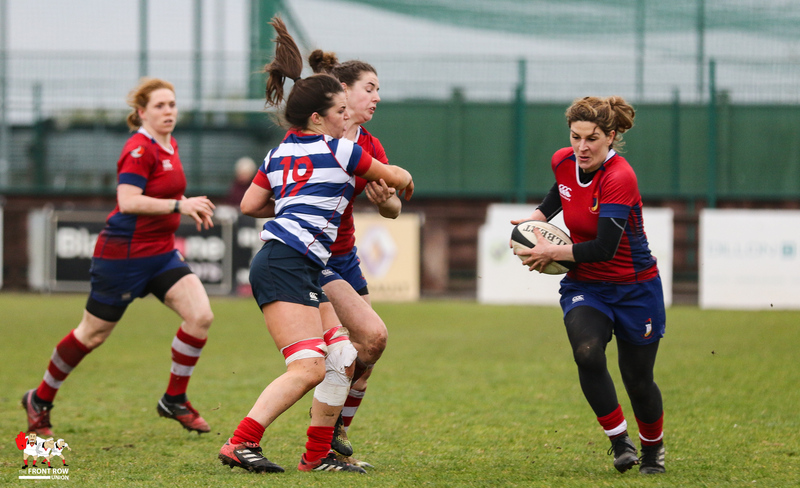 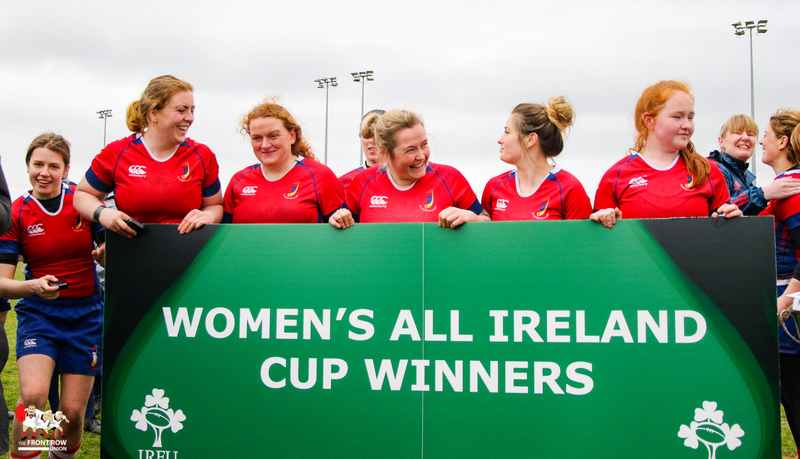 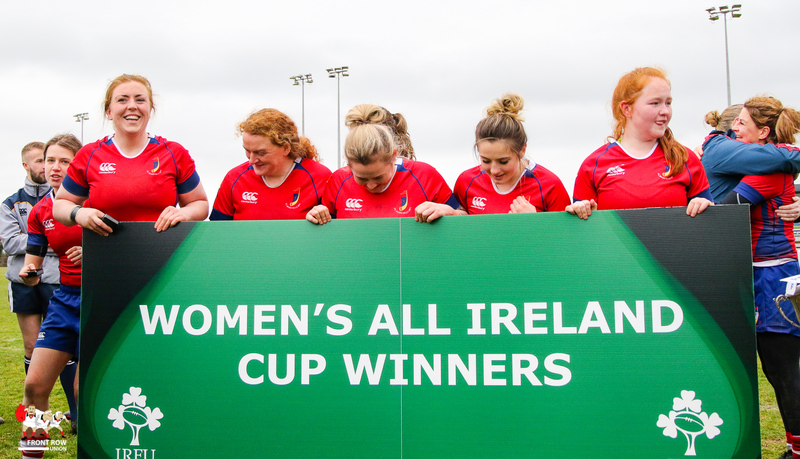 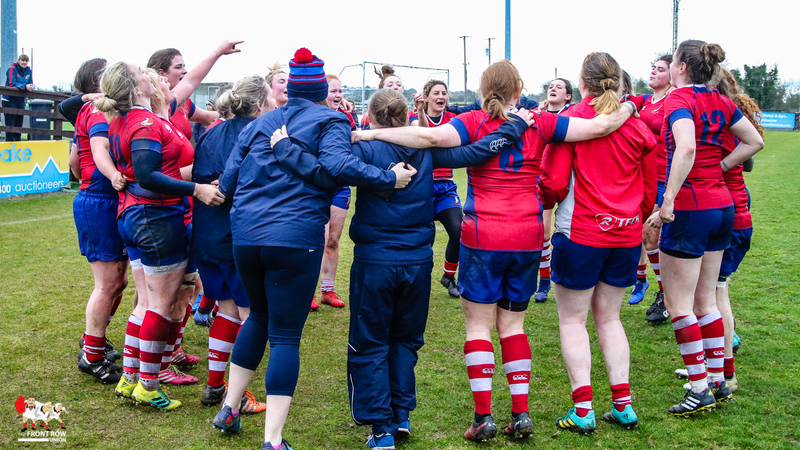 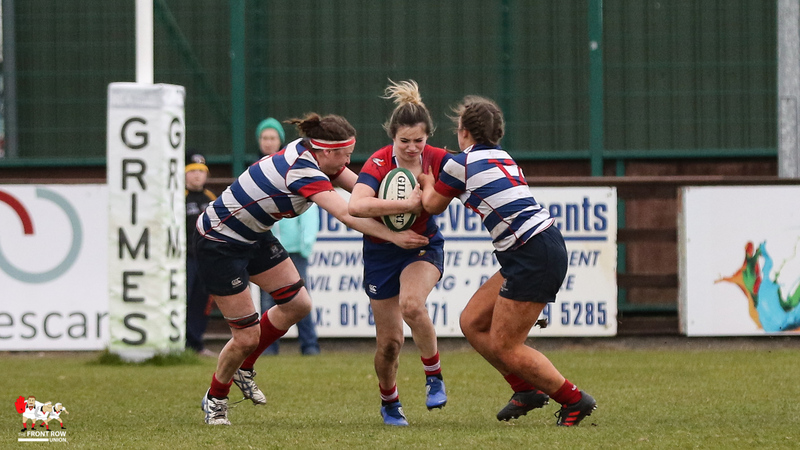 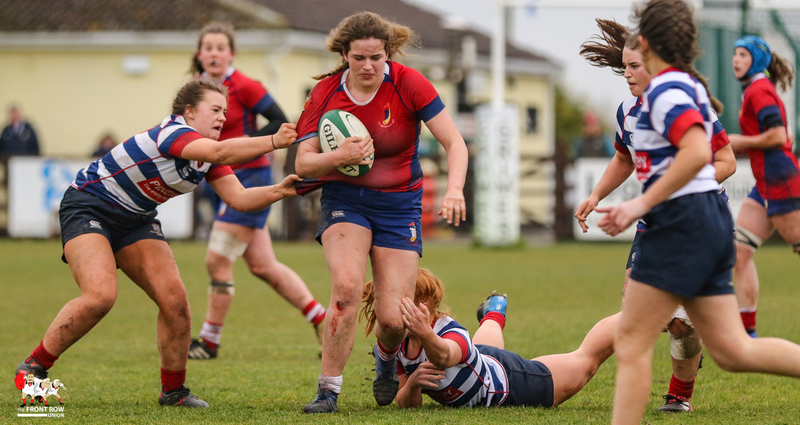 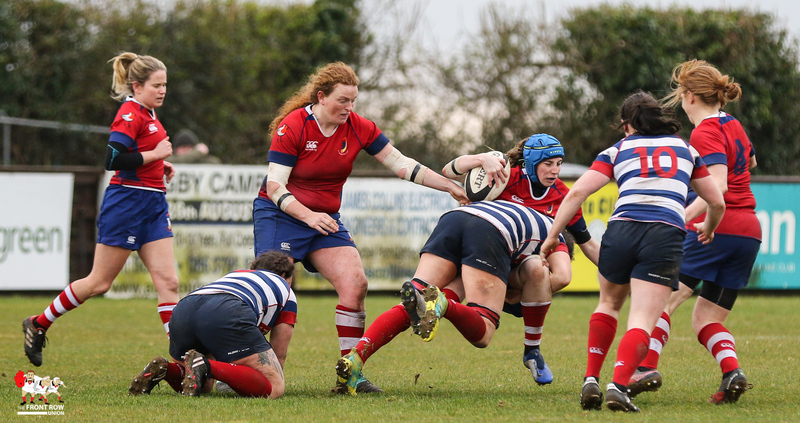 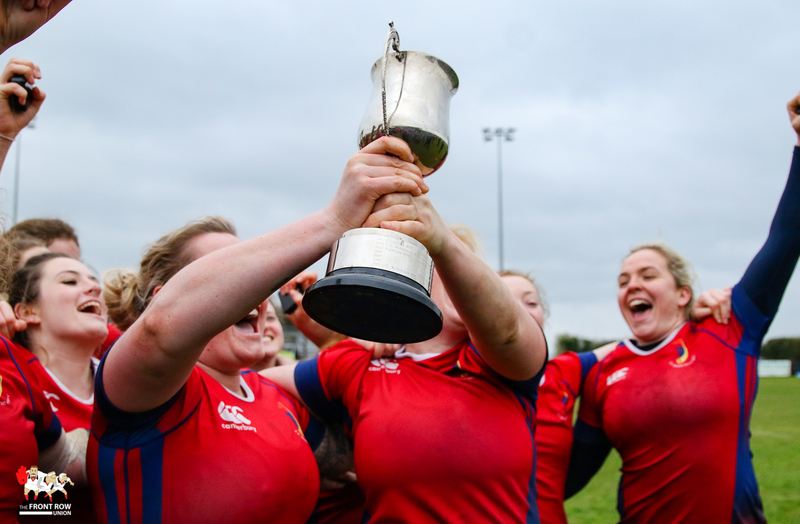 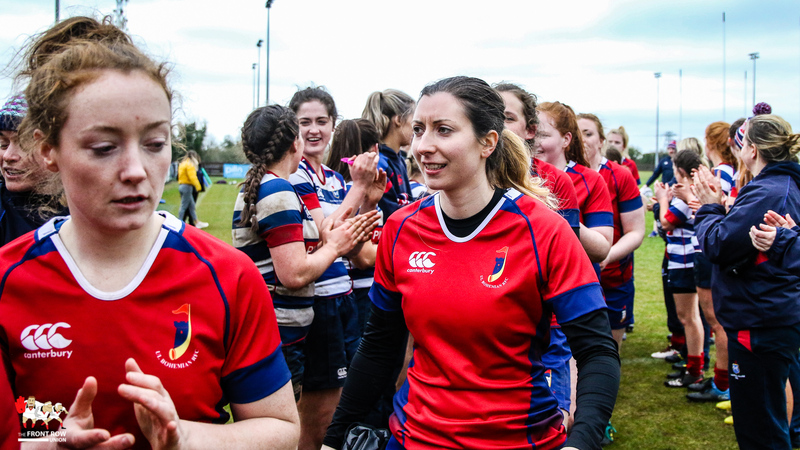 UL Bohemian will now have thier sights firmly set on a League and Cup double after picking up thier sixth Women’s All Ireland Cup after a hard fought win against Blackrock College at Ashbourne on Saturday afternoon. 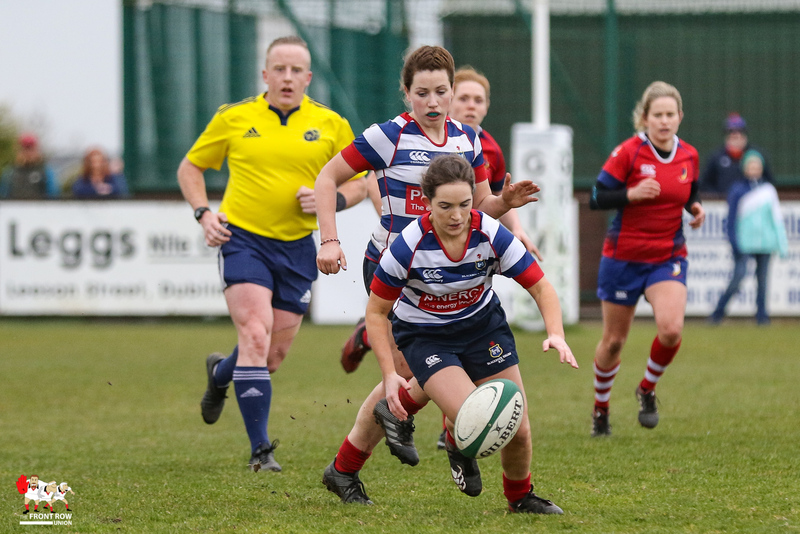 The clubs will go head to head again in two weeks time in Limerick when they meet in the semi final of the All Ireland League playoffs. 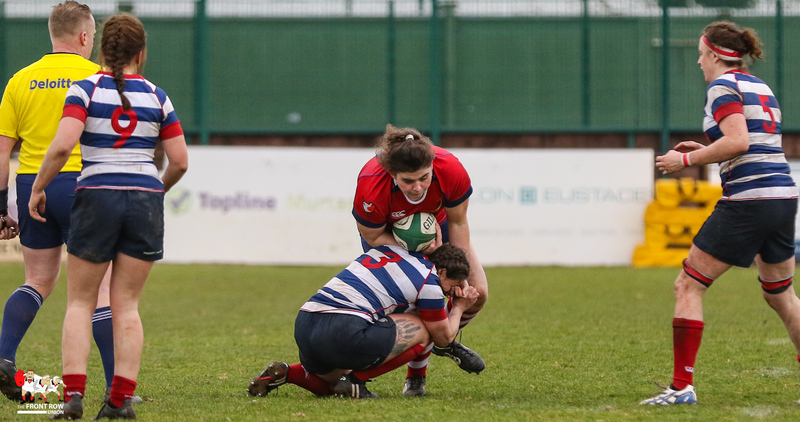 I didn’t catch the first half of this game, as it overlapped with the Shield Final, but we caught all of the second half and it was typical Boh’s as the mean, lean, red machine suffocated their opponents and when they broke they broke with accuracy, power and pace. 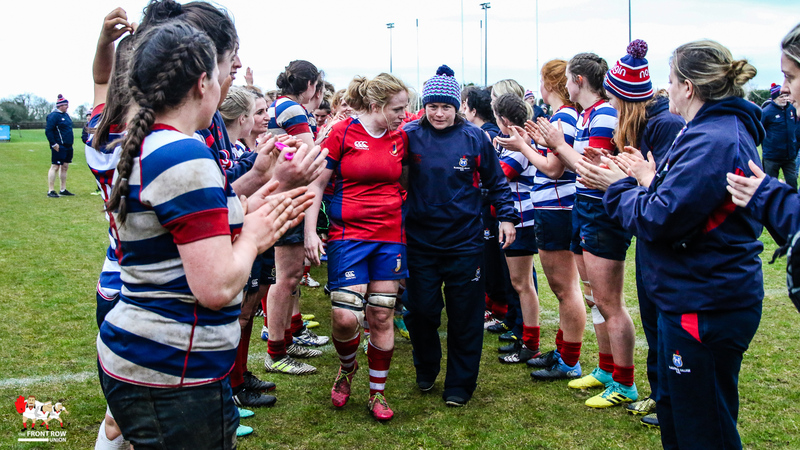 The much undervalued Aine Staunton led the way. 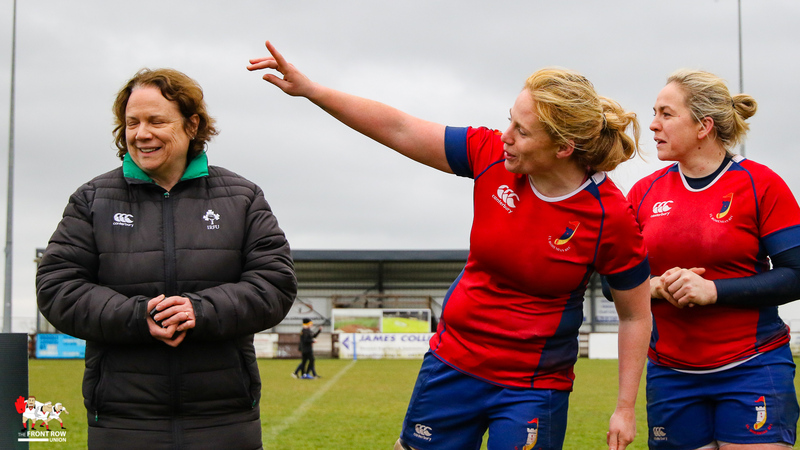 She really is a gem. 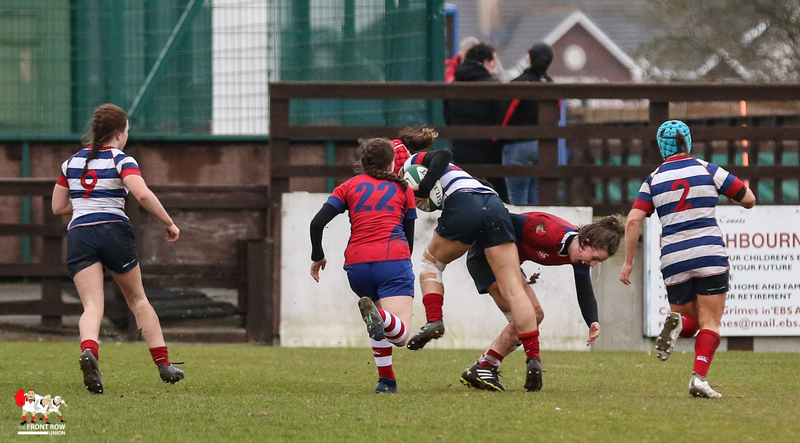 Almost perfect timing on joining the line and a real knack on reading the game, the Boh’s full back seldom puts a foot wrong. 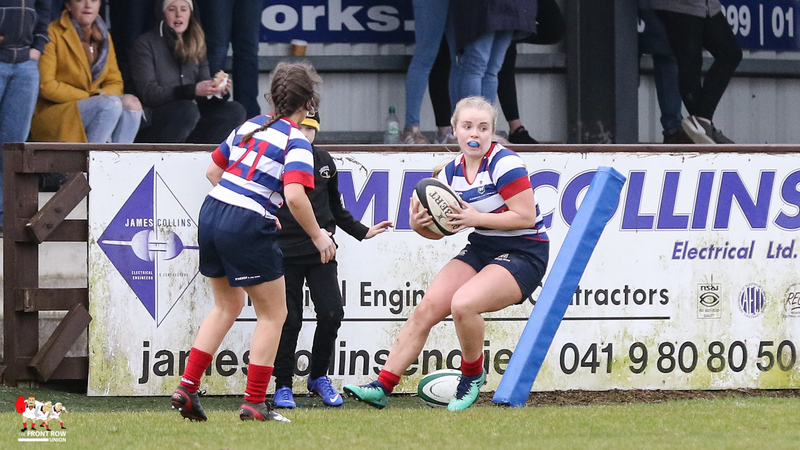 It was no surprise, after a series of breaks from deep, that Staunton was on the end of their move that delivered the second try. 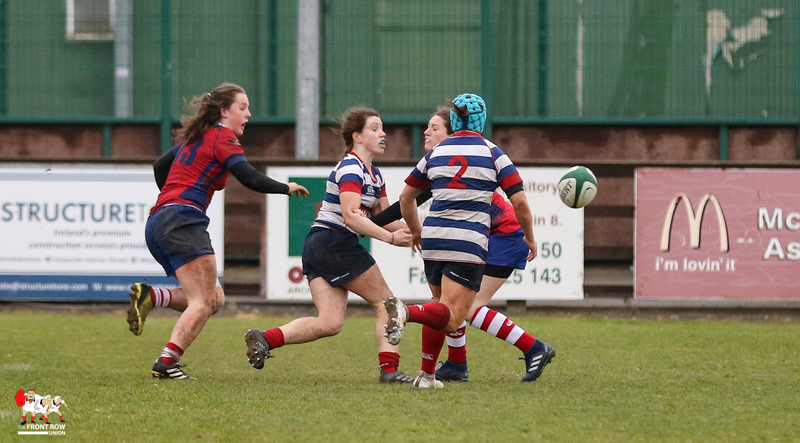 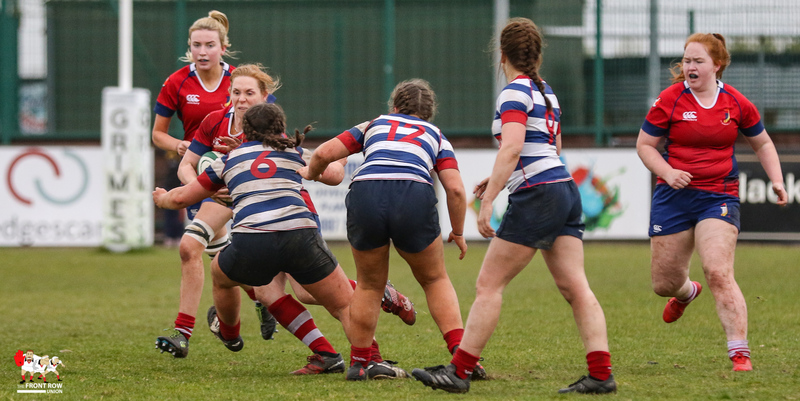 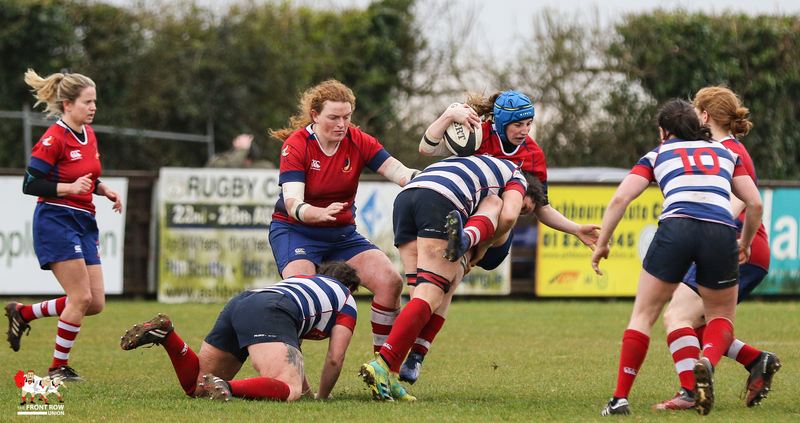 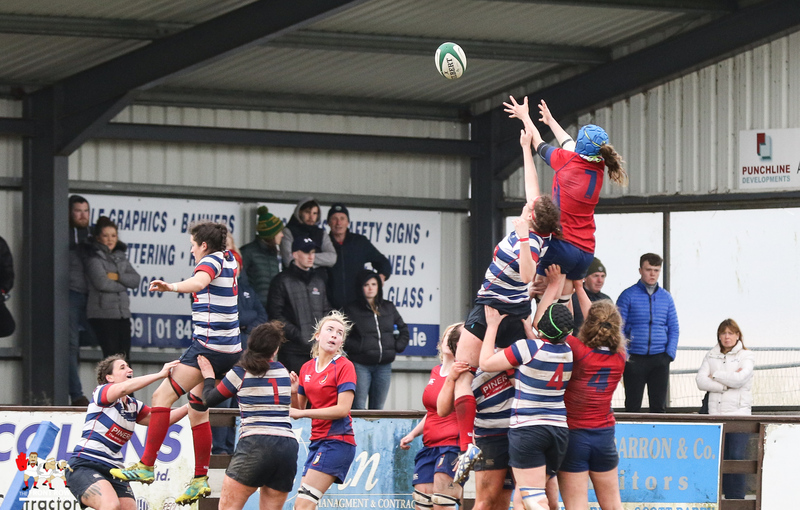 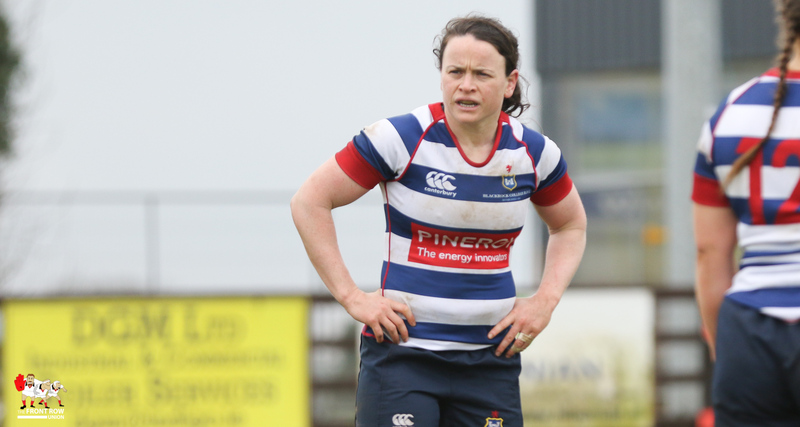 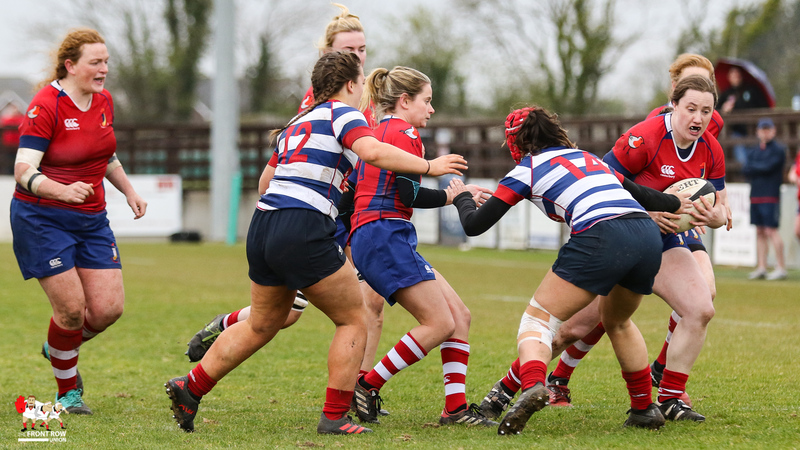 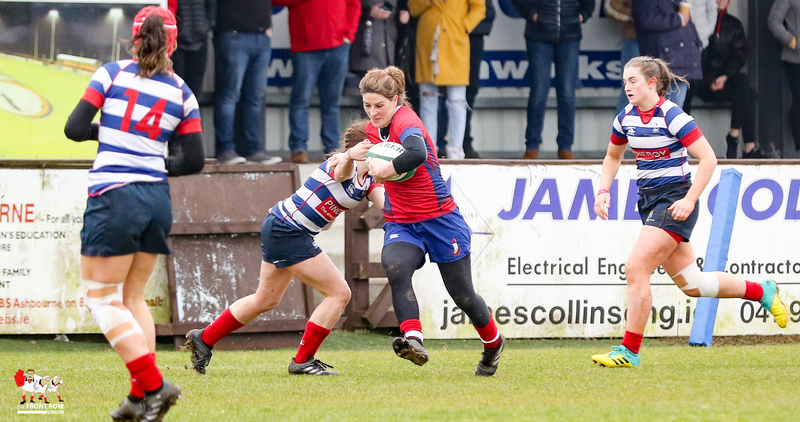 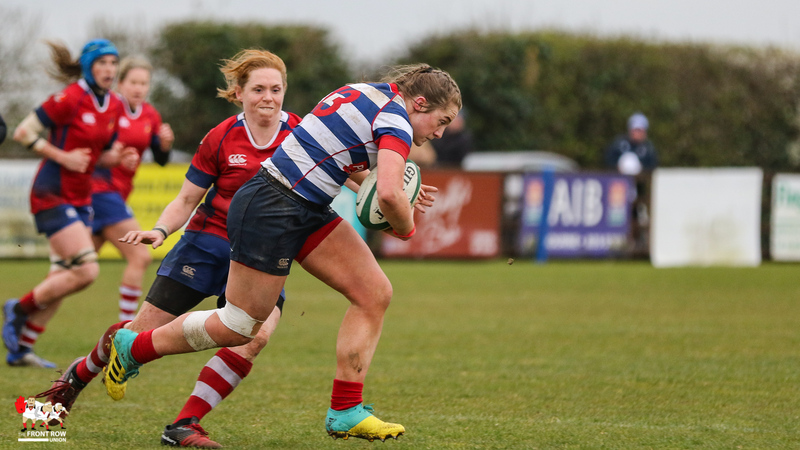 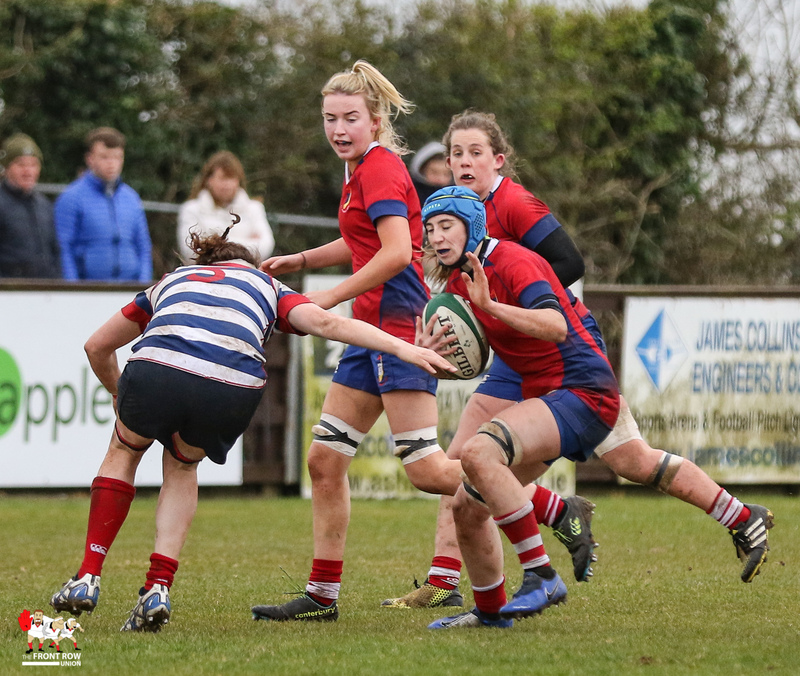 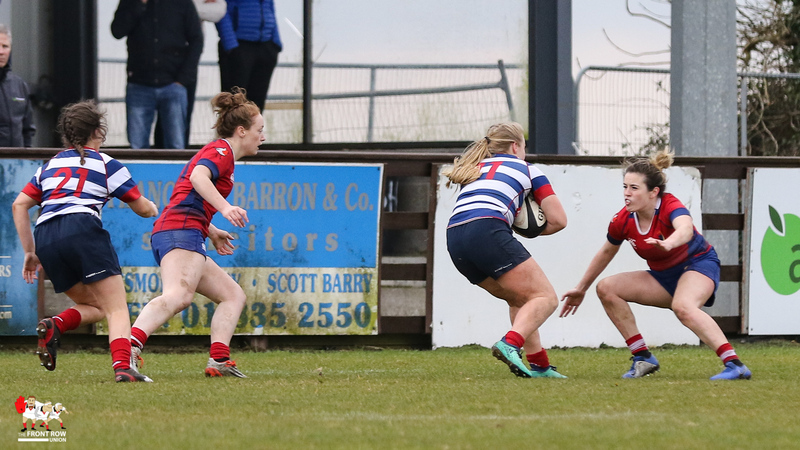 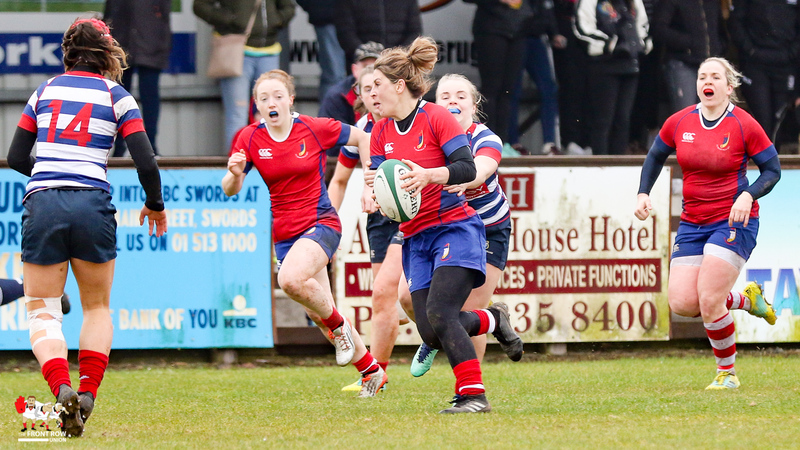 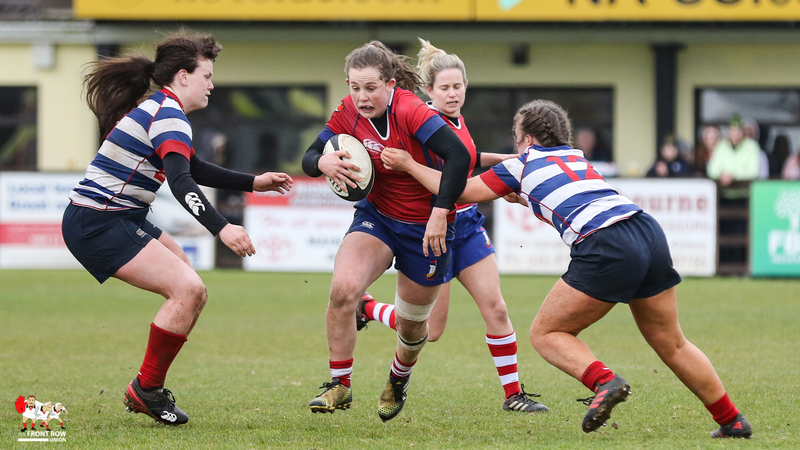 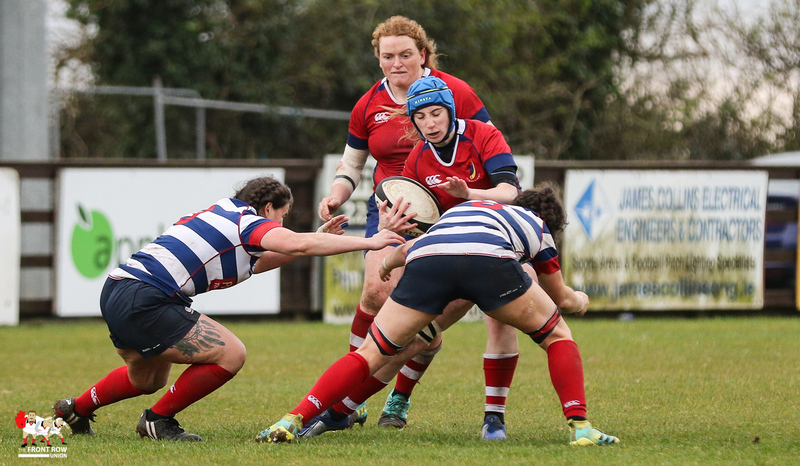 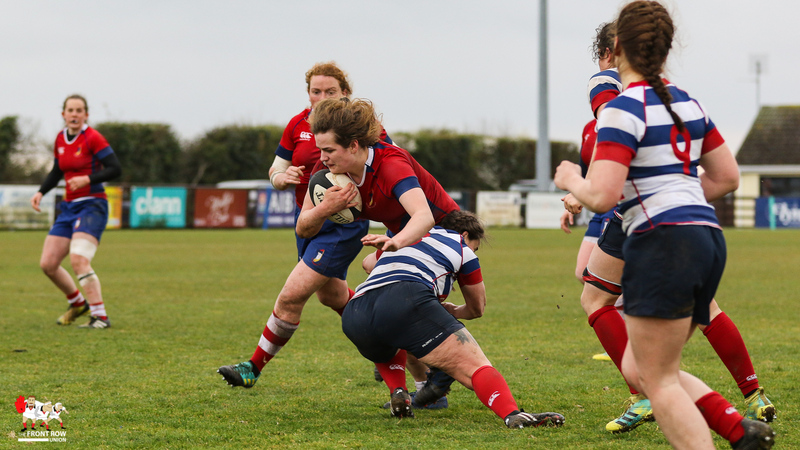 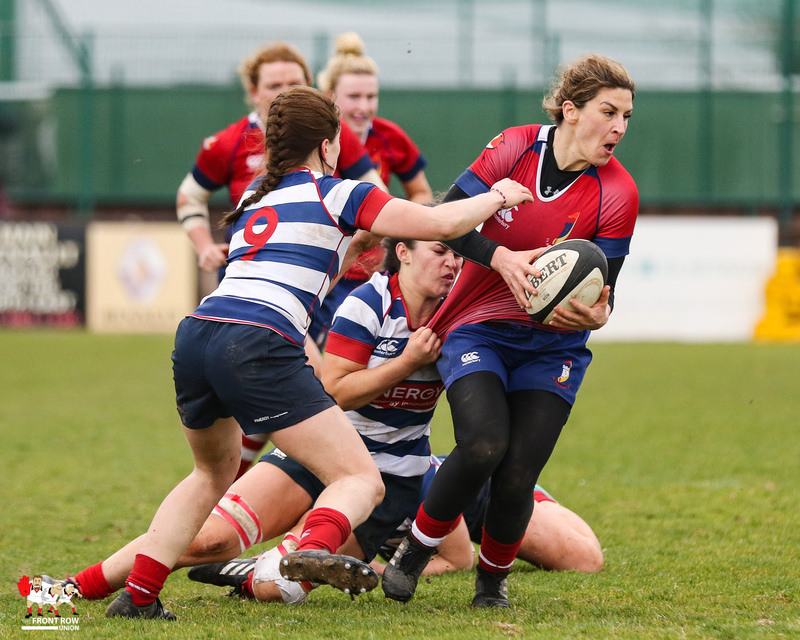 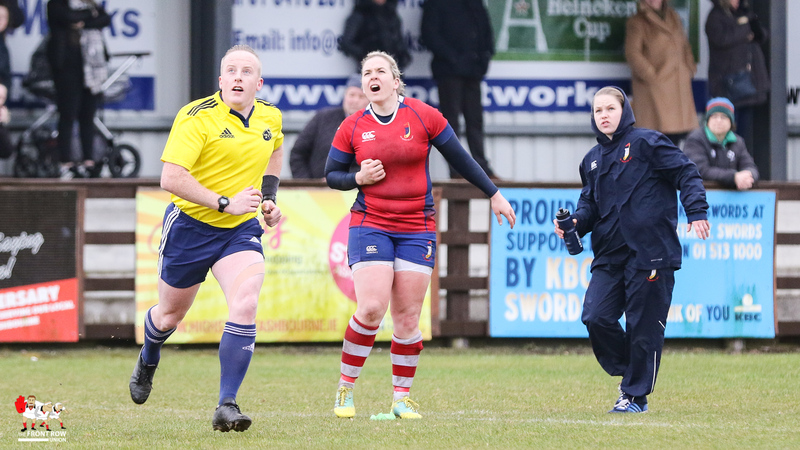 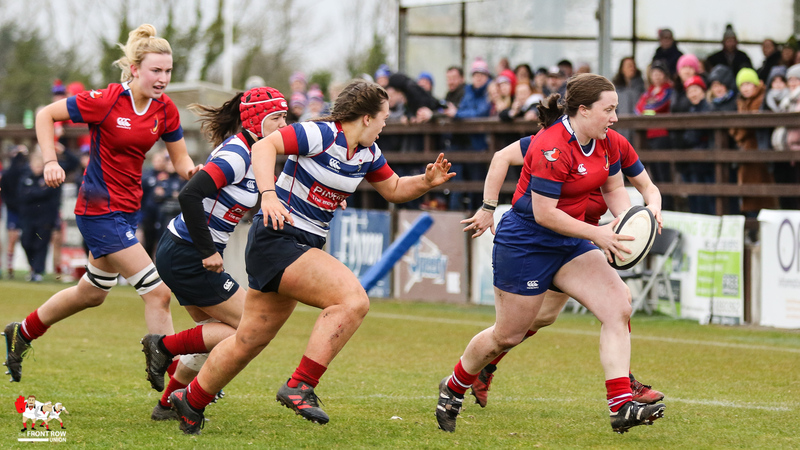 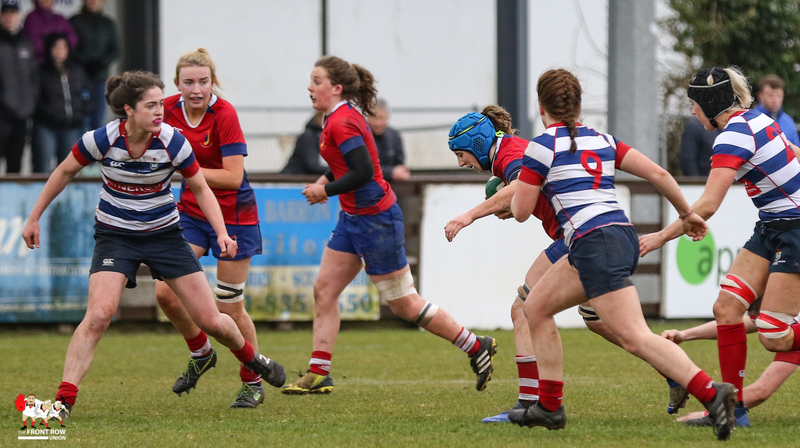 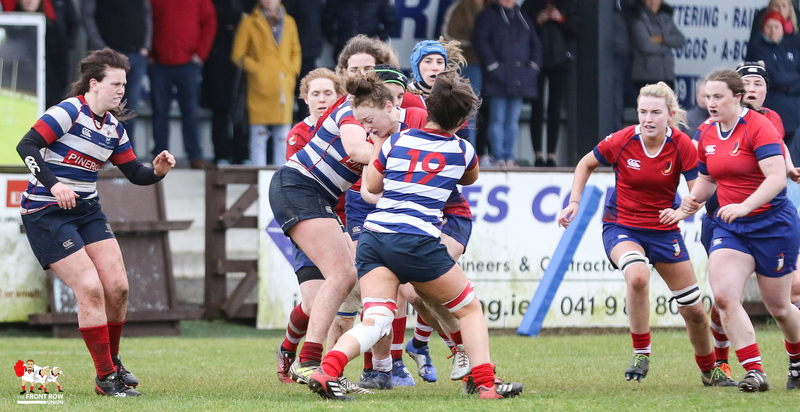 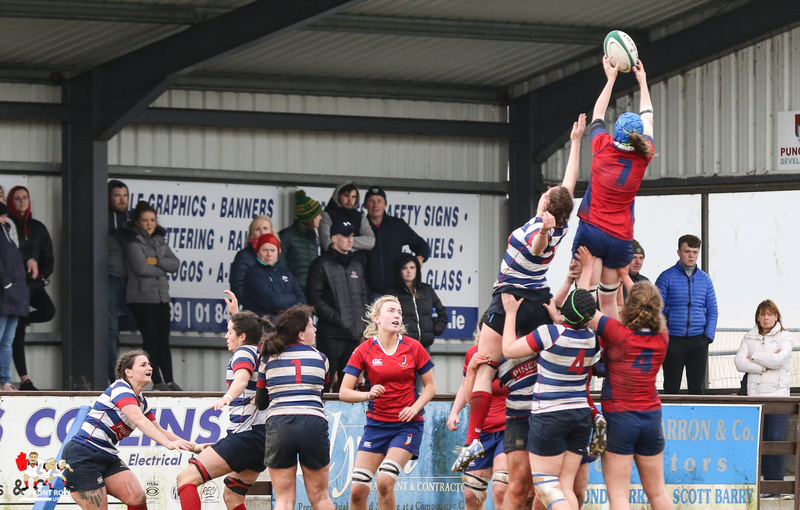 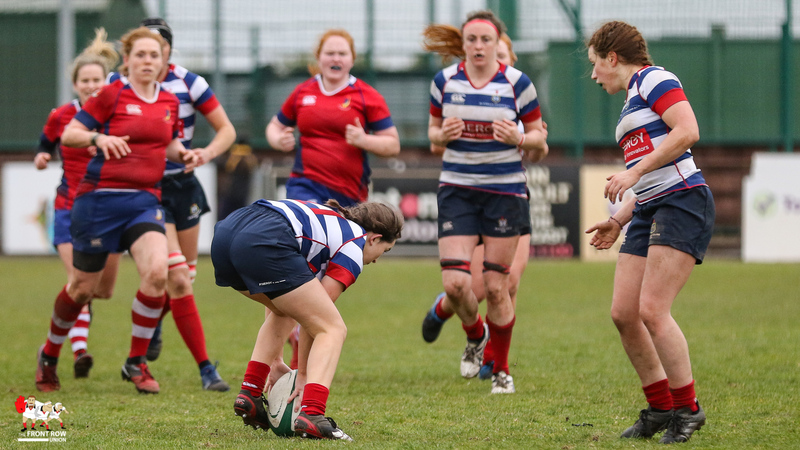 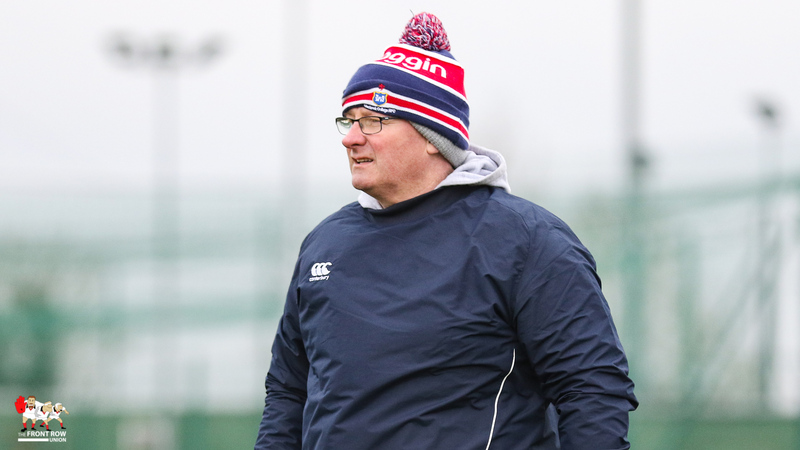 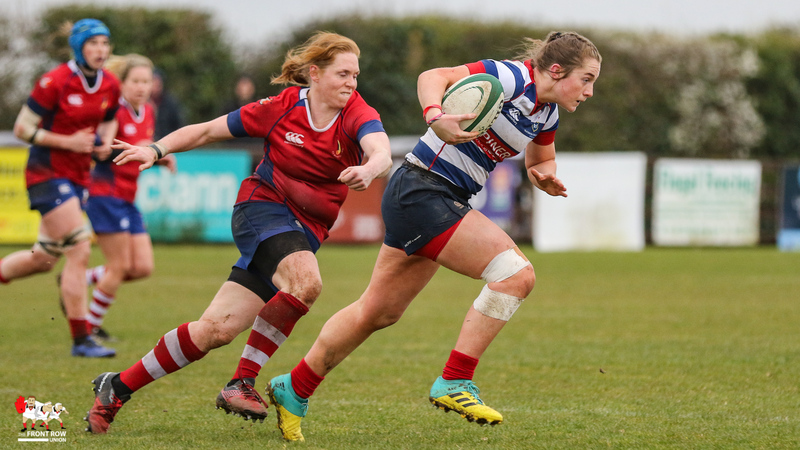 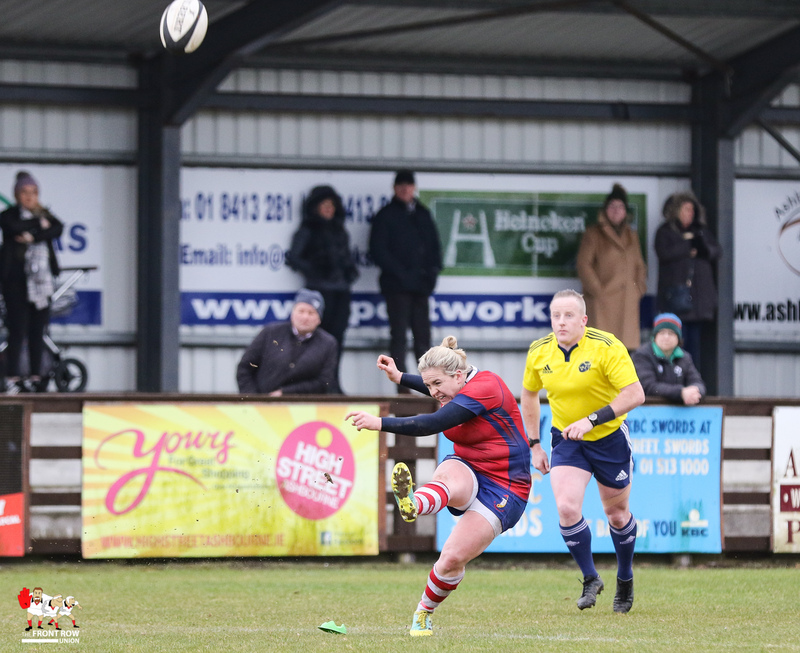 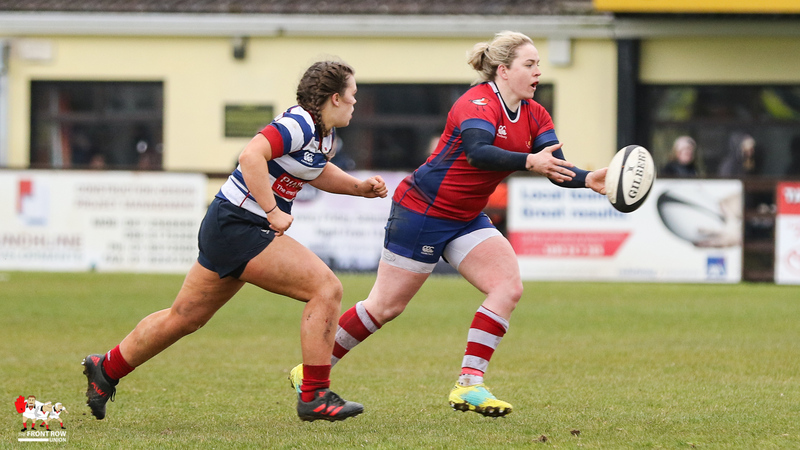 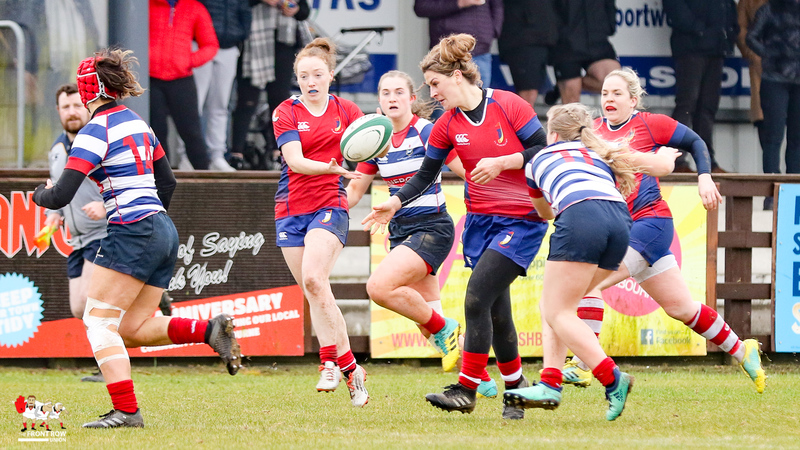 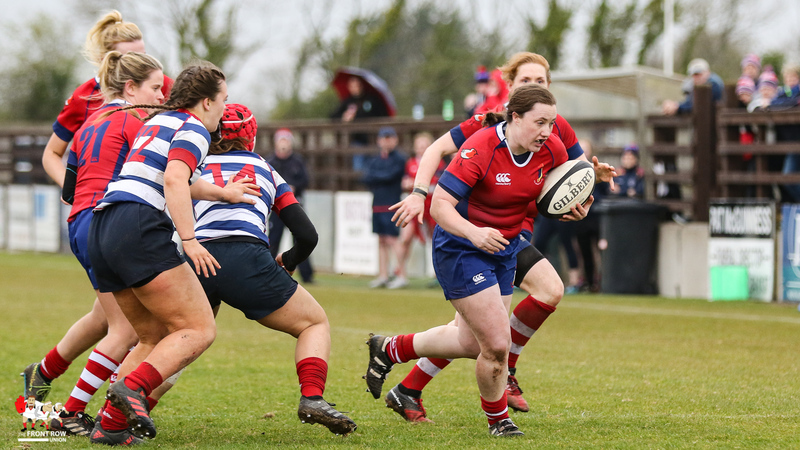 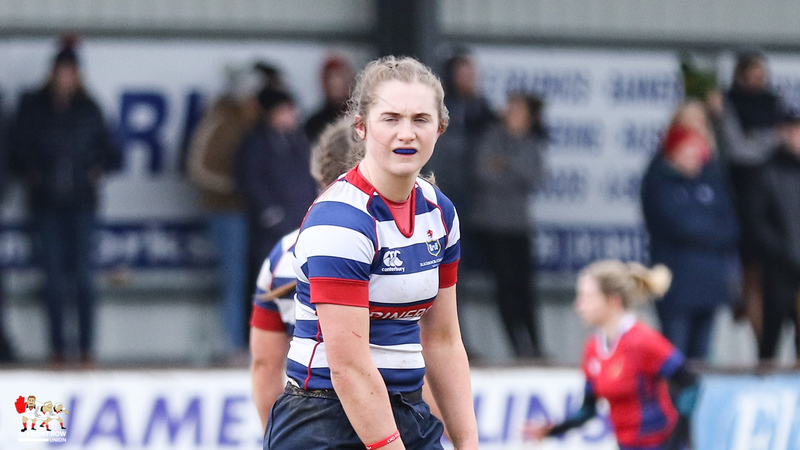 Naimh Briggs conversion put Boh’s 17 – 0 in front following a try from Laura Sheehan, converted by Briggs, in the first half to add to a penalty at the start of the second. 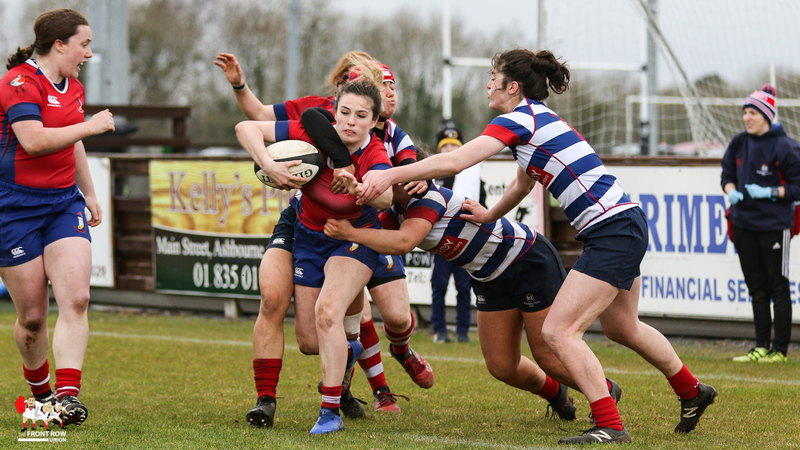 Rock worked hard, but they just couldn’t find that final pass until five minutes from the end when Caoimhe Molloy powered over for their only score of the game, the conversion attempt from Hannah O’Connor bouncing back off the upright. 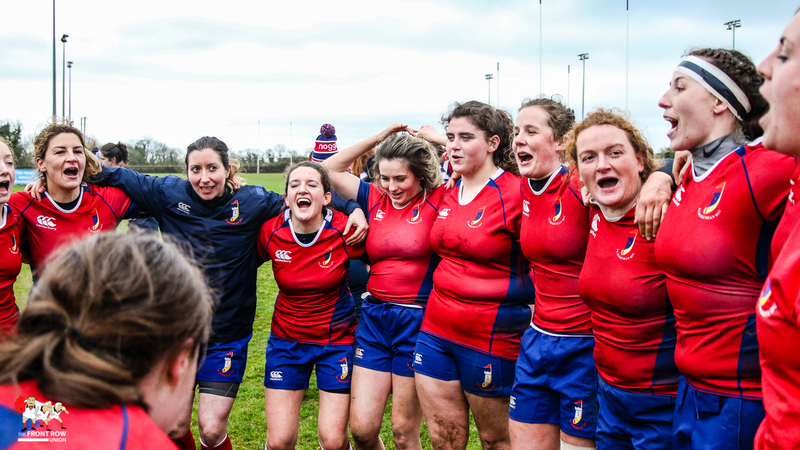 UL BOHEMIAN: Aine Staunton, Stephanie Nunan, Enya Breen, Rachel Allen, Laura Sheehan, Niamh Briggs, Helen McDermott, Fiona Hayes, Kate Sheehan, Fiona Reidy, Claire Bennett, Aoife O’Sullivan, Chloe Pearse, Clodagh O’Halloran, Sarah Quin.Replacements: Sarah O’Gorman, Edel Murphy, Geena Behan, Sarah Garrett, Caoimhe Tiernan, Laura O’Mahony, Rosie Newton. 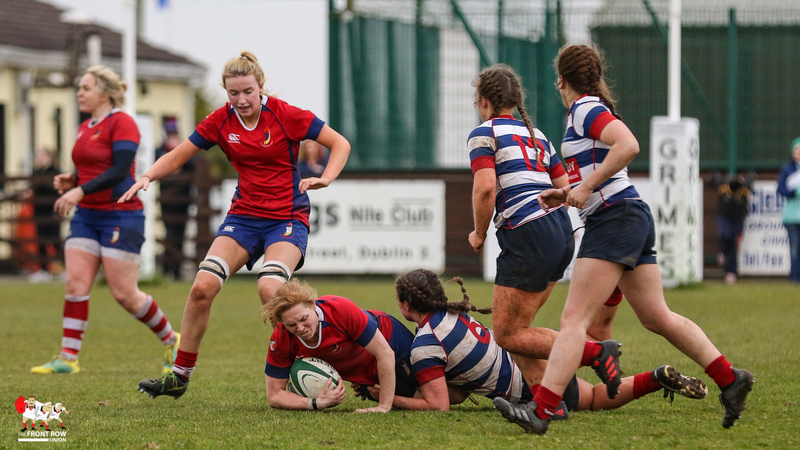 BLACKROCK COLLEGE: Ellen Taite, Natasja Behan, Alison Coleman, Maeve Og O’Leary, Ray Lawless, Jackie Shiels, Niamh Griffen, Caoimhe Molloy, Ann Marie Rooney, Manuela McCarthy, Judy Bobbett, Mairead Holohan, Meadbh Scally, Grace Kelly, Hannah O’Connor. 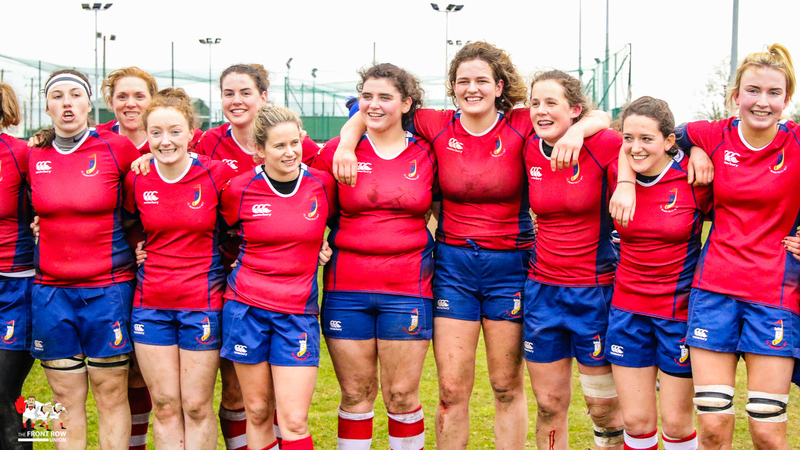 Replacements: Lena Fitzsimons, Meadhbh O’Callaghan, Aoife Browne, Tess Meade, Jenni Burke, Laura Delaney, Amy Cotter.